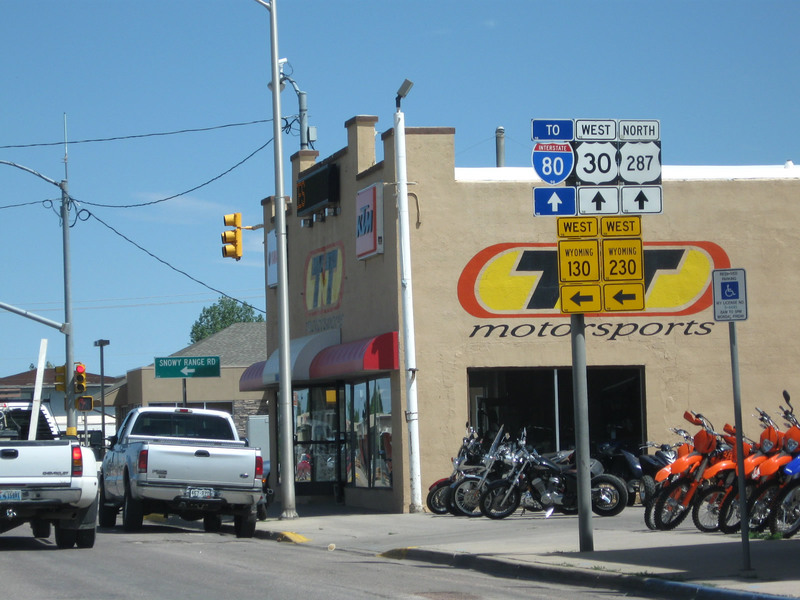 Between Exits 310 and 316, Business Loop I-80 serves Laramie via Curtis Street, U.S. 30-287 on Third Street and U.S. 30 on Grand Avenue. 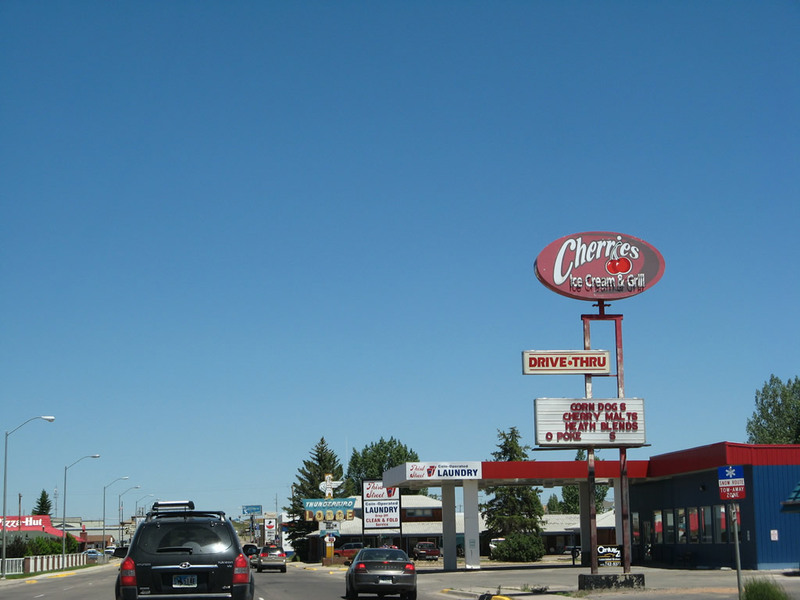 Between Interstate 80 and U.S. 30-287 (Third Street), Business Loop I-80 east follows Curtis Street past a series of truck stops, then crosses the Union Pacific Railroad. After passing over the viaduct, the business route connects with U.S. 30-287. Photo taken 09/07/05. The Laramie River, which passes through the city of Laramie, meanders through an undeveloped greenbelt area west of downtown Laramie. 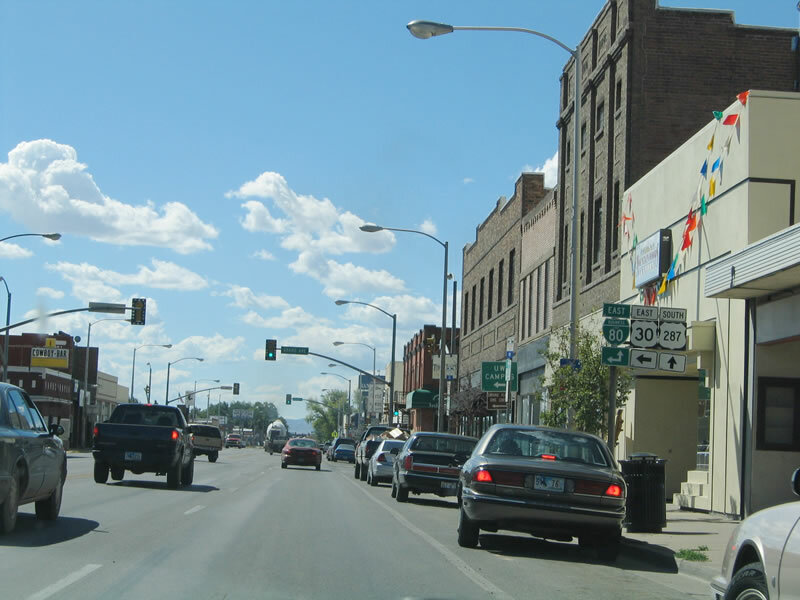 Most of Laramie's development is focused east of the Union Pacific Railroad; the downtown eateries that line First Street face toward the railroad. The river is largely ignored. Part of the reason for this is due to pollution; chemicals used in the fabrication of railroad ties have polluted the ground around the river, thus making it unavailable for immediate development. 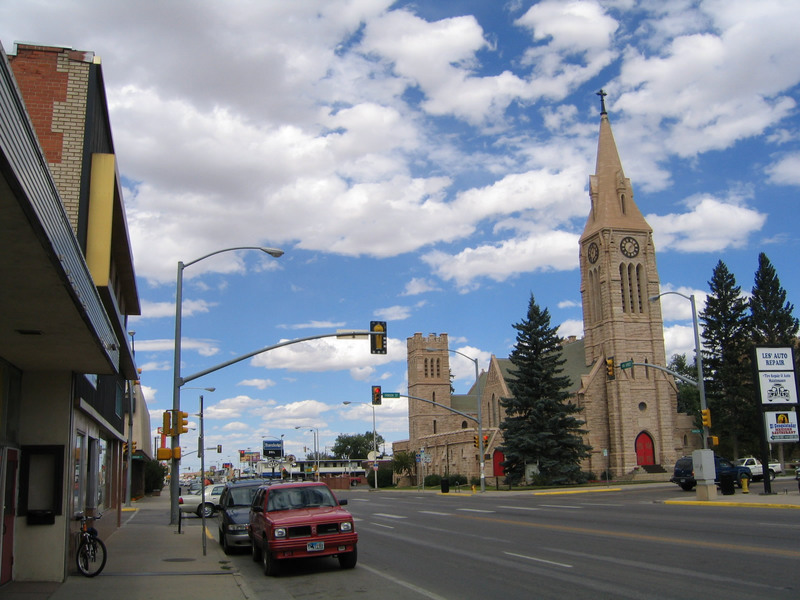 But it is also psychological, since the railroad has dominated so much about Laramie for so long. 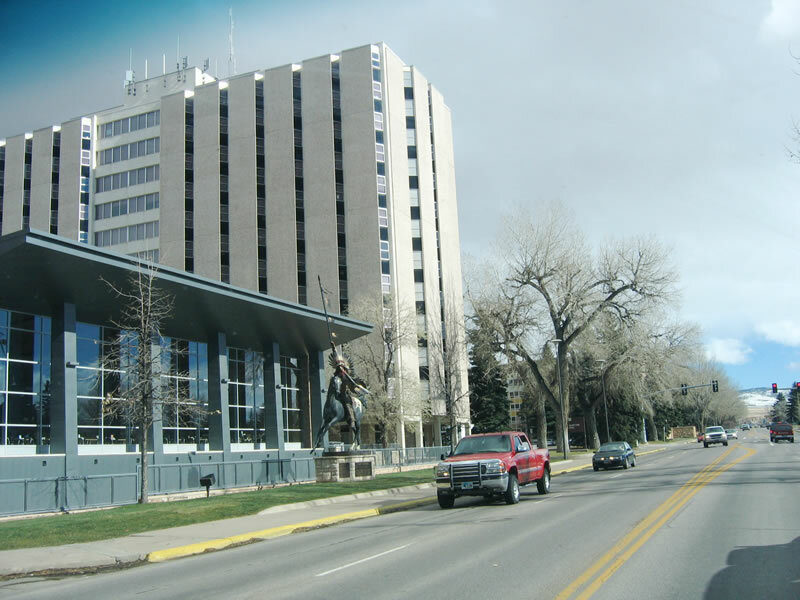 The presence of the University of Wyoming east of downtown also fosters development on that side of the city. Photo taken 09/07/05. Eastbound Business Loop I-80 approaches U.S. 30-287, Third Street, as the highway prepares to cross over the Union Pacific Railroad. Photo taken 09/07/05. To continue on eastbound Business Loop I-80, turn right (south) onto Third Street. Straight ahead, Curtis Street continues as a local street, offering access to many of the residential areas in the northern part of the city. Photo taken 09/07/05. 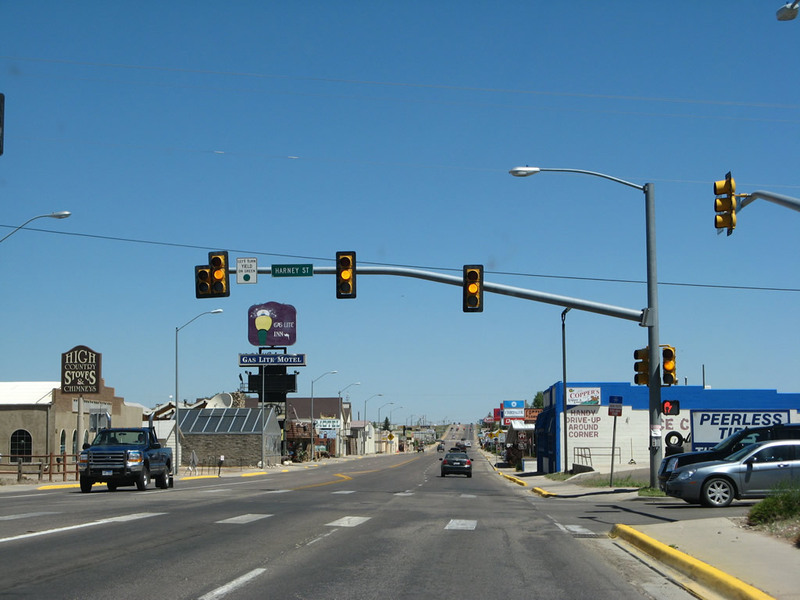 Third Street also carries U.S. 30-287. 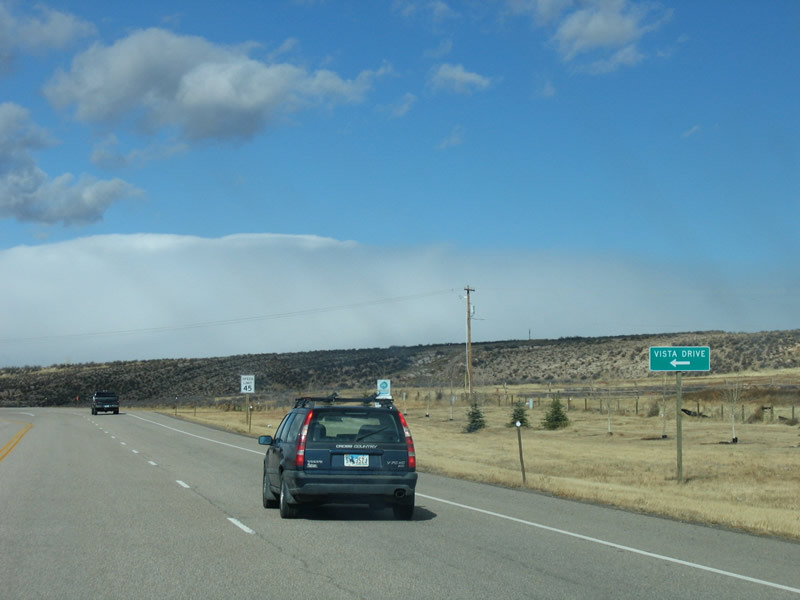 To the north, Third Street exits Laramie and follows the historic Lincoln Highway (U.S. 30-287) toward Bosler, Rock River, Medicine Bow, and Hanna. 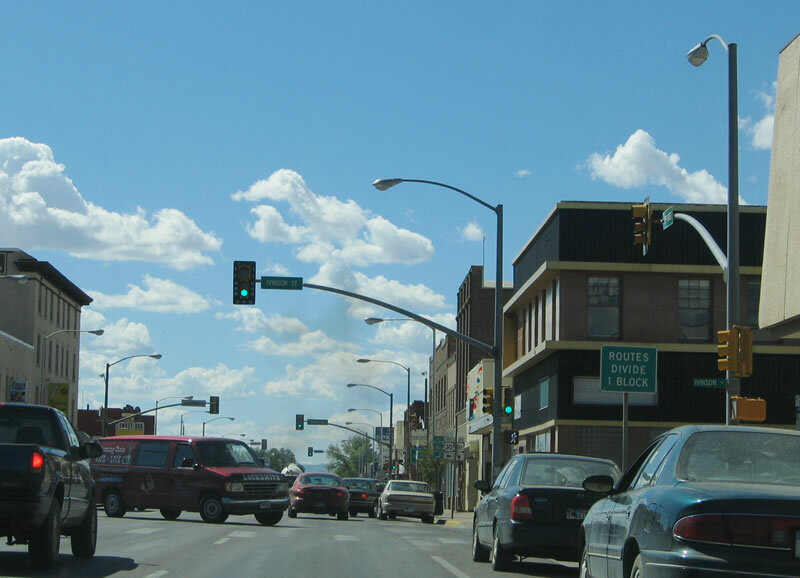 To the south, Third Street forms the most significant north-south corridor as it travels through downtown Laramie. 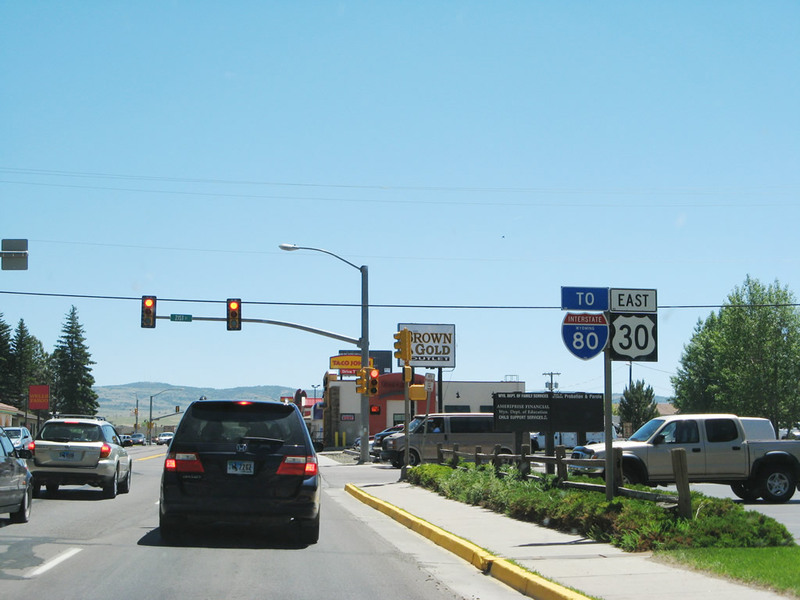 The three routes (Business Loop I-80, U.S. 30, U.S. 287) split at the Grand Avenue intersection in downtown Laramie. Photo taken 09/07/05. This is the first shield assembly along southbound Third Street for Business Loop I-80, U.S. 30, and U.S. 287. 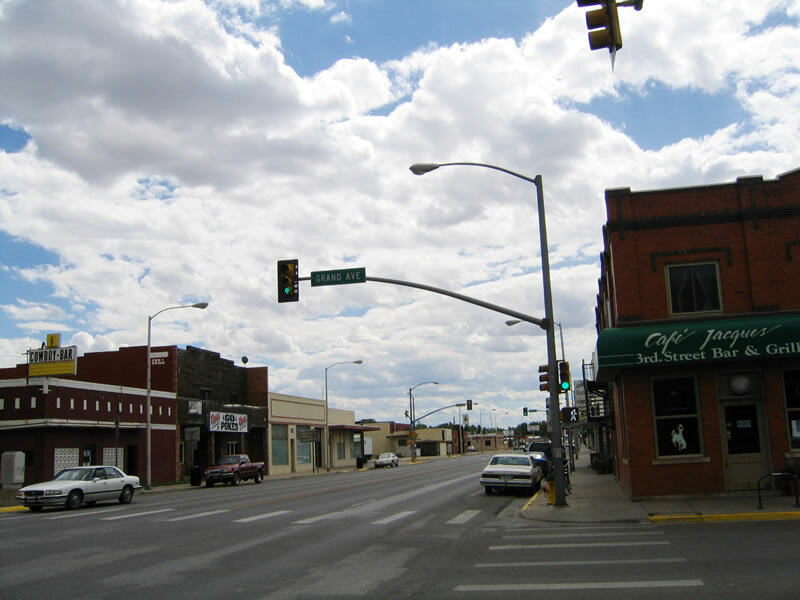 Third Street is a major commercial corridor. Photo taken 09/07/05. Eastbound Business Loop I-80/U.S. 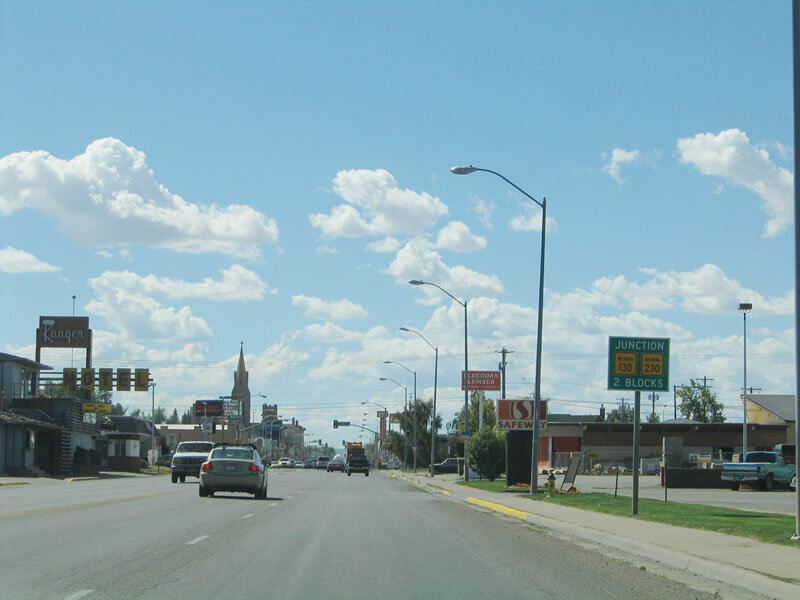 30 and southbound U.S. 287 (Third Street) reach Harney Street. A large shopping center on the west side of Third Street houses a K-Mart (Sears), Hastings Music/Books, and Safeway grocery store. Photo taken 09/07/05. 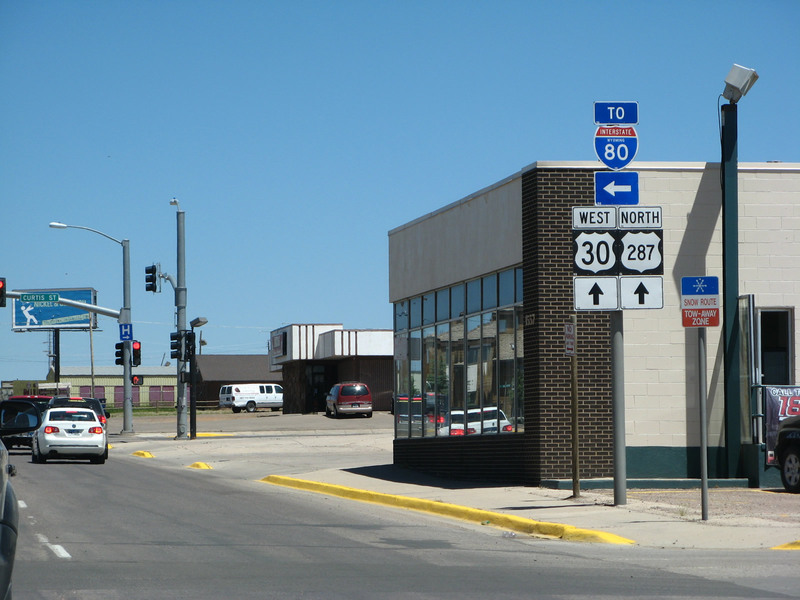 The next major intersection along southbound Third Street is Clark Street and the junction with Wyoming 130 and Wyoming 230. This shield assembly shows where all of the routes go. 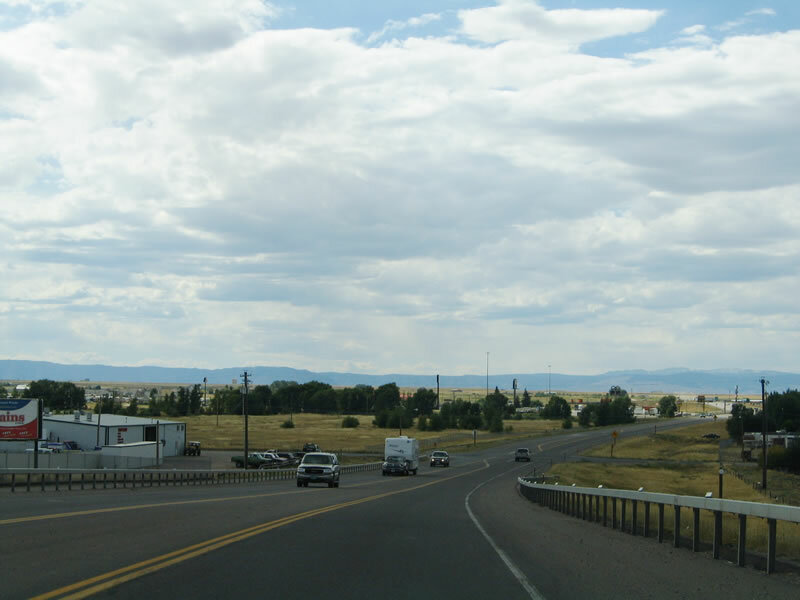 The two state routes lead west from here, with Wyoming 130 heading due west toward the airport, the town of Centennial, and the Snowy Range Scenic Byway. 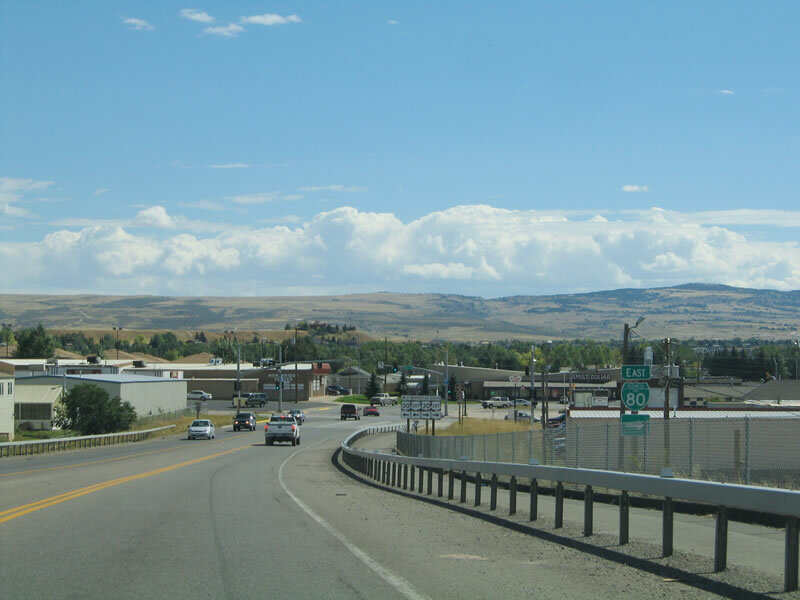 Wyoming 230 leads southwest toward Jelm Mountain, enters Colorado to connect to Colorado 125 and Colorado 127, and re-enters Wyoming in Carbon County southeast of Encampment and Riverside. The routes meet again in the North Platte River Valley at a point some eight miles south of Saratoga. Photo taken 09/07/05. 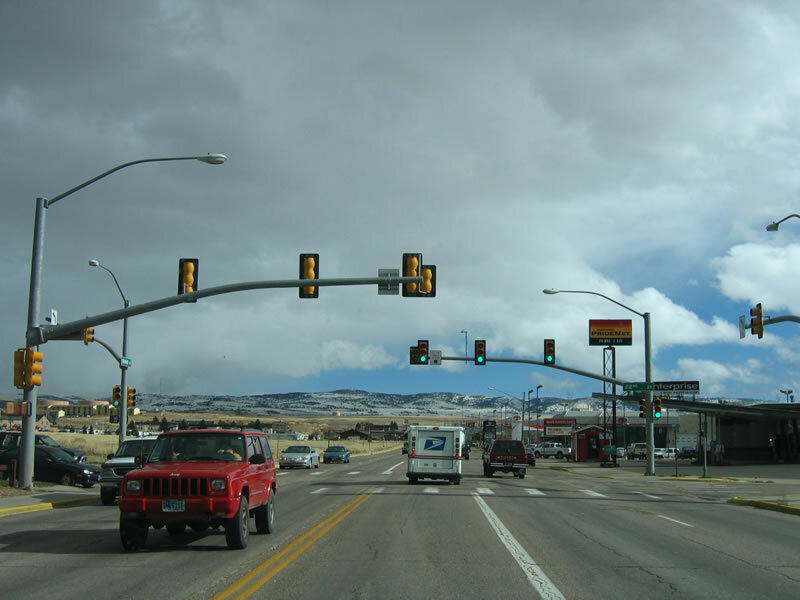 Eastbound Business Loop I-80 and U.S. 30 and southbound U.S. 287 (Third Street) meet Wyoming 130 and Wyoming 230/Snowy Range Road west and Clark Street east just north of downtown Laramie. 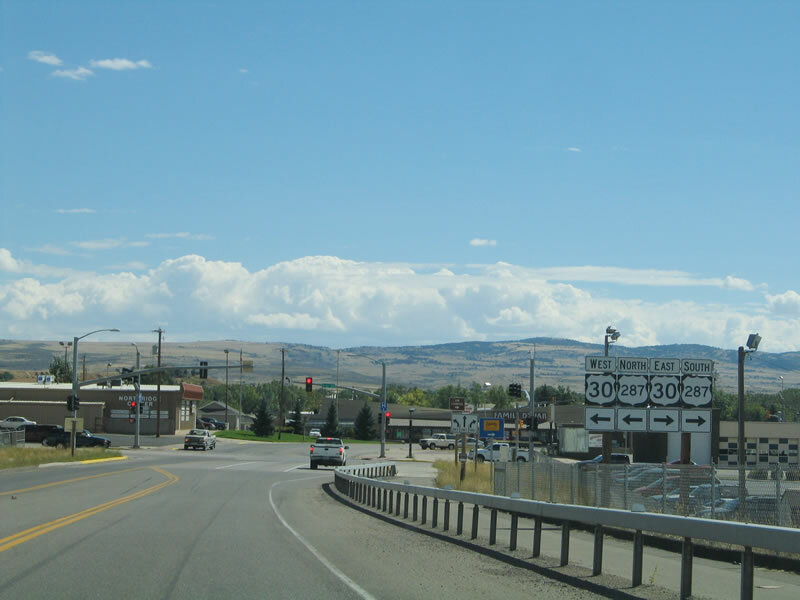 This marks the eastern terminus of both Wyoming 130 and Wyoming 230. Plans call for this intersection to be realigned once a new railroad viaduct is constructed over the nearby Union Pacific Railroad tracks. Photo taken 09/07/05. Third Street enters the downtown area as it approaches Corral West Ranchwear; a church steeple dominates the horizon of downtown. Photo taken 09/07/05. 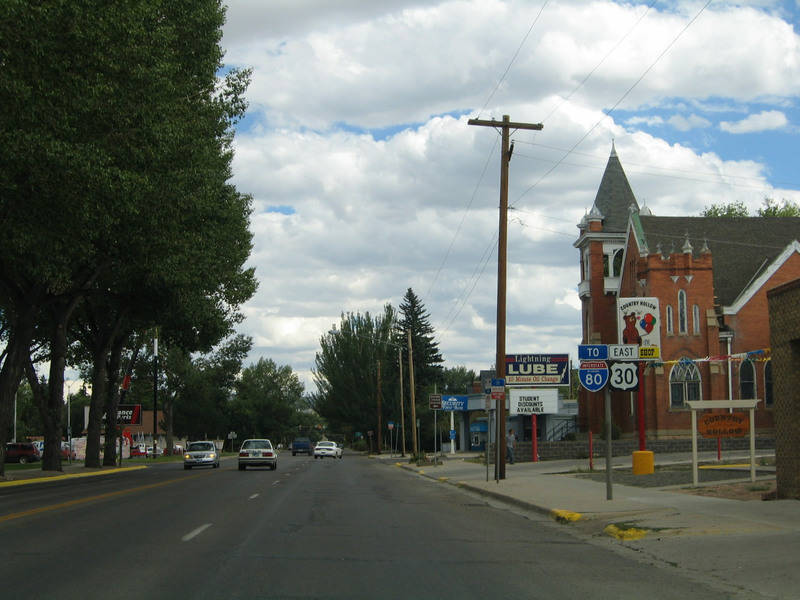 The next major intersection along southbound is University Avenue, which heads west into downtown and east toward the University of Wyoming. Photo taken 09/07/05. 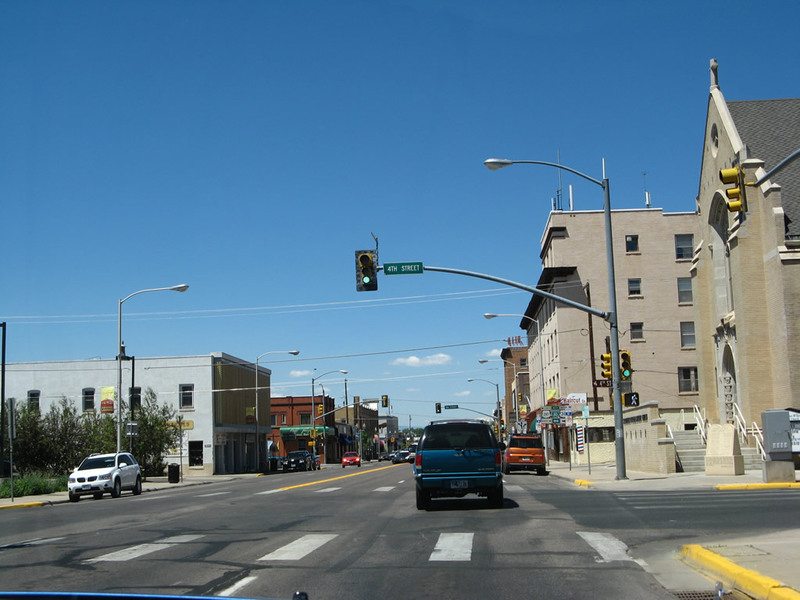 The next intersection is Ivinson Street, which also travels east toward the University of Wyoming. 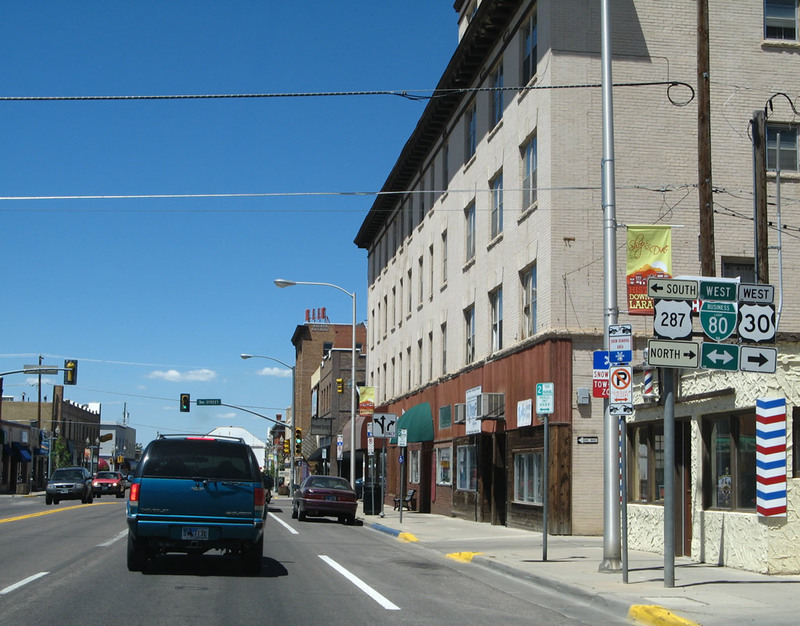 To the west, Ivinson Street enters historic downtown Laramie. Photo taken 09/07/05. 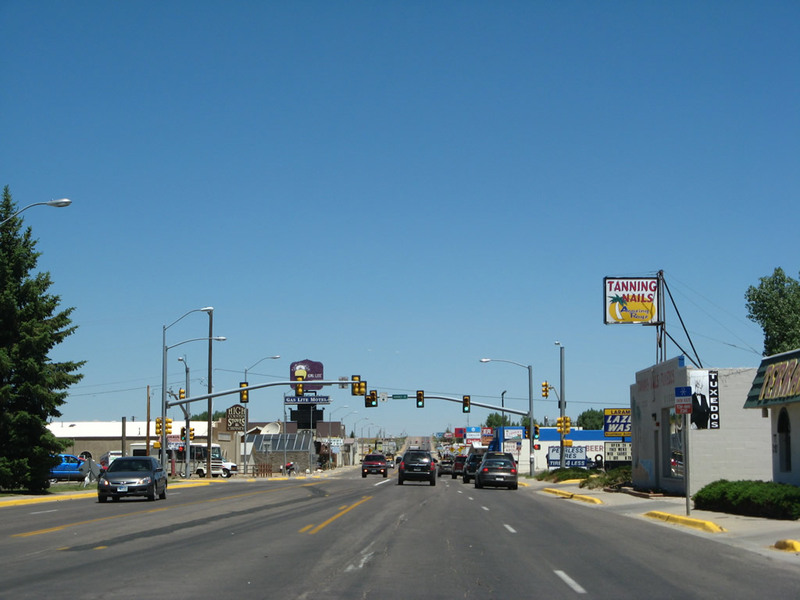 U.S. 30 and Business Loop I-80 turn east onto Grand Avenue, while U.S. 287 continues south on Third Street. The next photo shows a close up of the shield assembly. Photo taken 09/07/05. Note the unusual arrow underneath the green business loop shield. 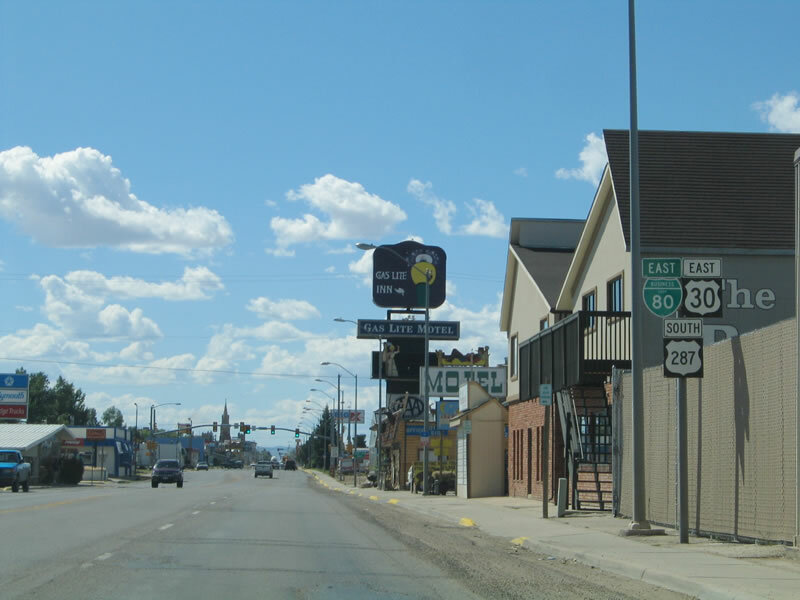 While it is true that motorists can continue south on Third Street to return to Interstate 80, the business loop does not follow U.S. 287 south. Instead, the business loop turns east onto Grand Avenue to pass by the university prior to rejoining Interstate 80 at the base of Sherman Hill. Photo taken 09/07/05. 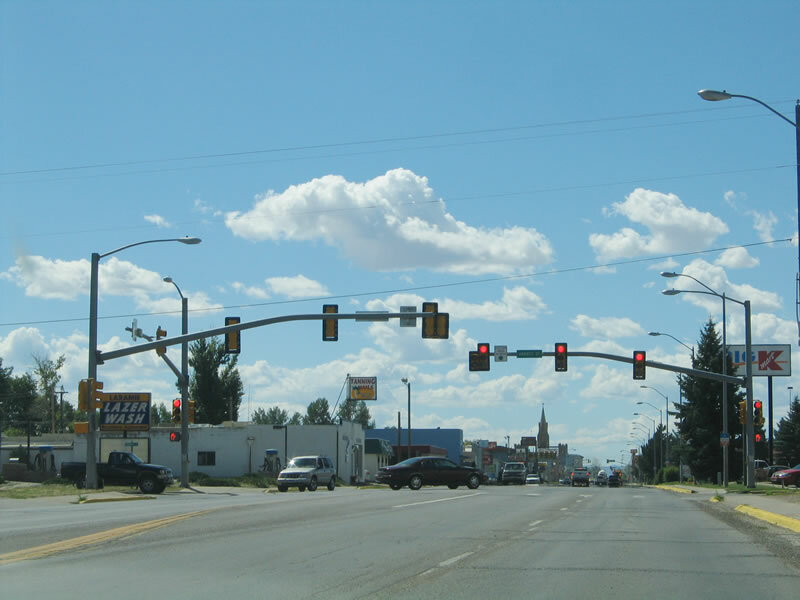 Follow Grand Avenue east to the University of Wyoming and the Laramie Plains Civic Center. Photo taken 09/07/05. 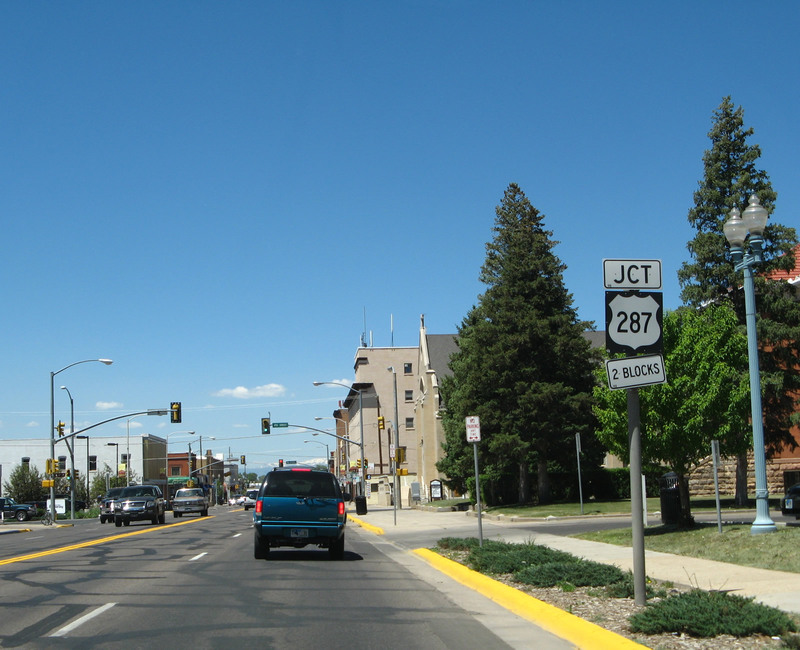 Southbound U.S. 287 continues straight ahead on Third Street and eastbound Business Loop I-80 and U.S. 30 travel east along Grand Avenue toward the civic center, city library, and university. To the west, Grand Avenue goes for two more blocks into downtown before ending at First Street. Photo taken 09/07/05. 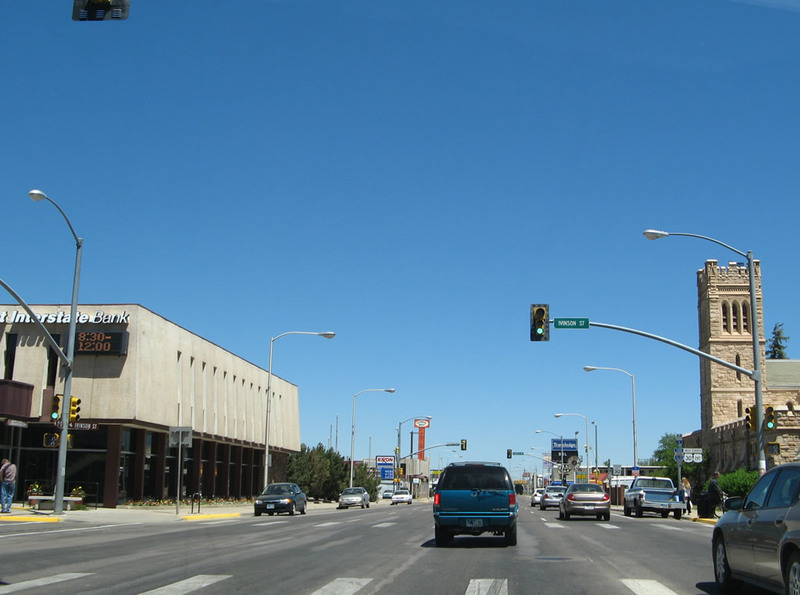 Here is a view of the same intersection as seen from eastbound Grand Avenue at Third Street. The business loop and U.S. 30 continue straight ahead on Grand Avenue. Photo taken 09/07/05. 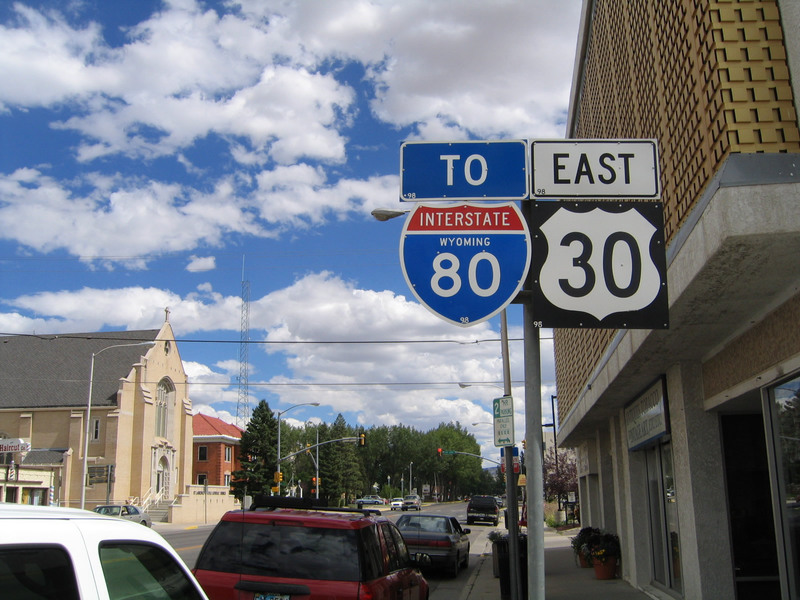 Business Loop I-80 and U.S. 30 resume their journey due east along Grand Avenue in downtown Laramie. For some reason, the Department of Transportation decided to sign the business loop as "To Interstate 80" some four miles before Grand Avenue gets to Interstate 80! And the business loop still has not passed by the civic center, the library, the university, the stadium, and the eastern commercial district! Grand Avenue really should be signed as Business Loop I-80 east at least until 30th Street, after the university and stadium. But hey, what do we know? Photo taken 09/07/05. 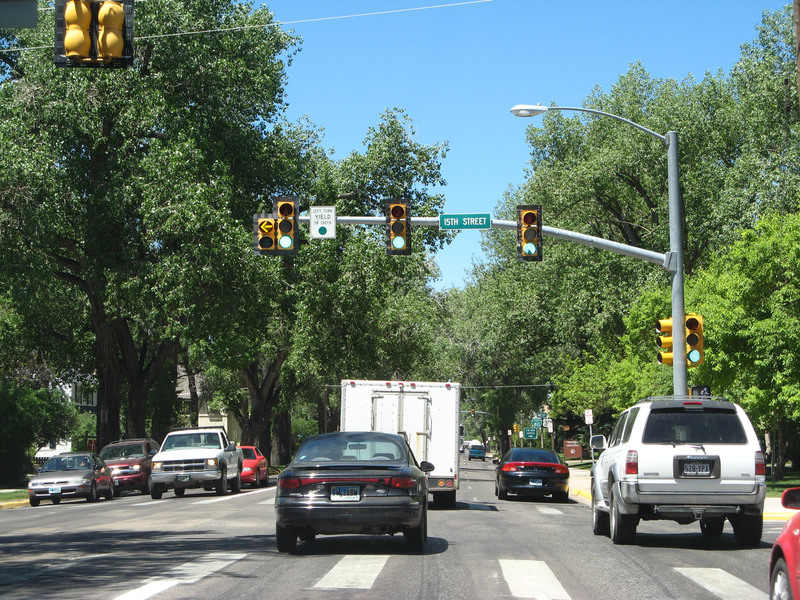 Grand Avenue is the primarily east-west thoroughfare, and it is five lanes wide initially but narrows through the "tree district" area east of Sixth Street. 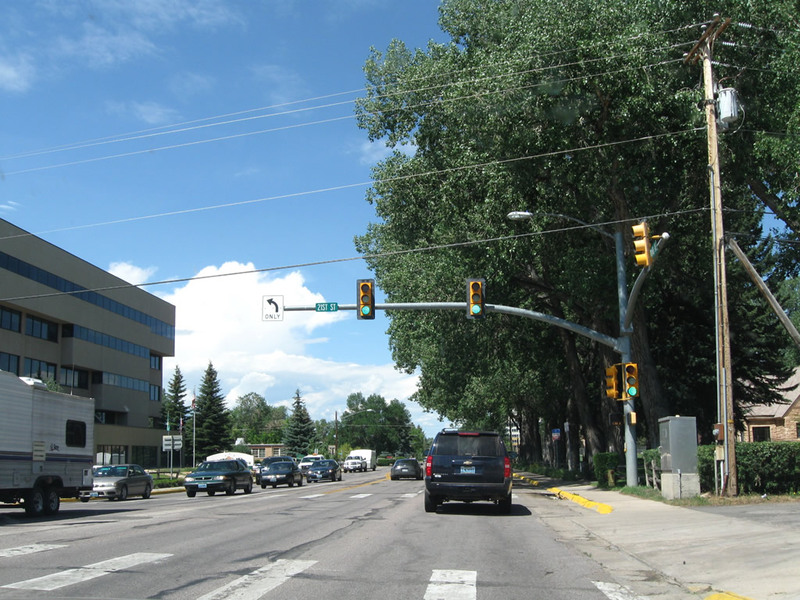 This major east-west arterial begins at the Union Pacific Railroad tracks at First Street, picks up the business loop and U.S. 30 designation at Third Street, and parallels the University of Wyoming campus between Ninth Street and 30th Street. Most of the campus is concentrated between Ninth, Ivinson, 30th, and Harney Streets, just one block north of Grand Avenue. The dormitories are located adjacent to Grand Avenue between 15th Street and 18th Street, and War Memorial Stadium is near 22nd Street. Photo taken 09/07/05. 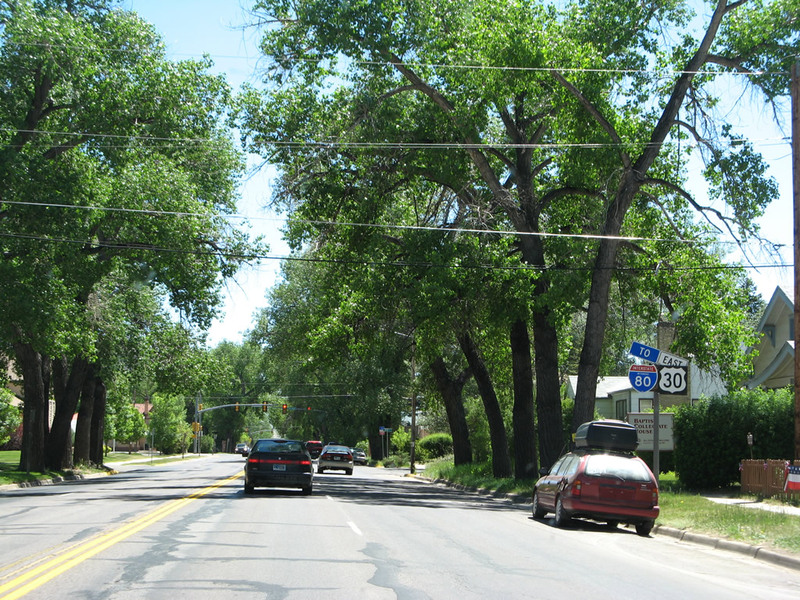 At Sixth Street, Business Loop I-80 and U.S. 30/Grand Avenue enters the Laramie University Neighborhood District, which is often referred to as the tree area due to the presence of towering cottonwood trees that line the roadway. This historic district extends beyond just Grand Avenue, as it extends roughly from University Avenue on the north to Custer Street on the south and from Sixth Street on the west to 15th Street on the east. 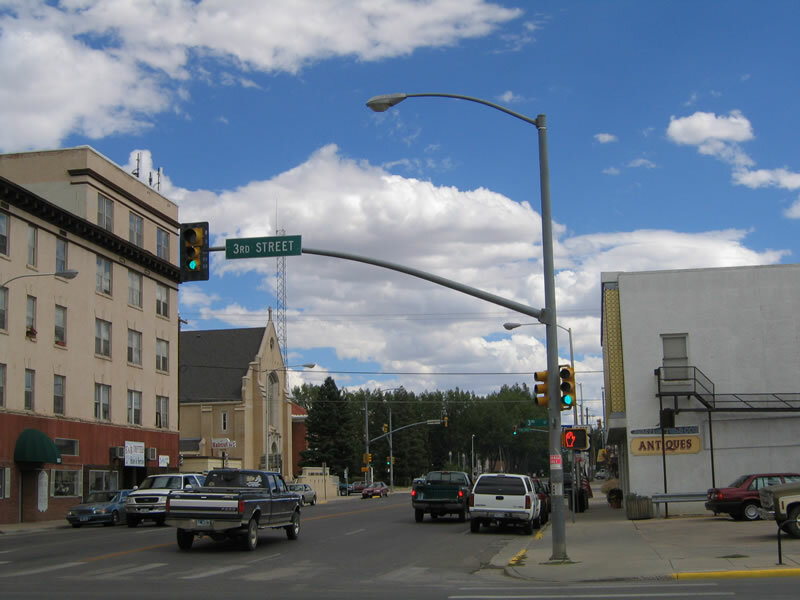 University Neighborhood historic District (page 1) notes that "the district comes within one block of the eastern boundary of the Laramie Downtown Historic District (NR, 11/10/88). The district is largely contained within the plat of the original town; however, the blocks between 11th and 13th Streets were platted under the Union Pacific Company's 4th Addition, and the blocks between 13th and 15th Streets were platted under the First Grand Avenue Addition. All three plats provided for wide streets, alleyways and tree strips, giving the district continuity in plan and layout." 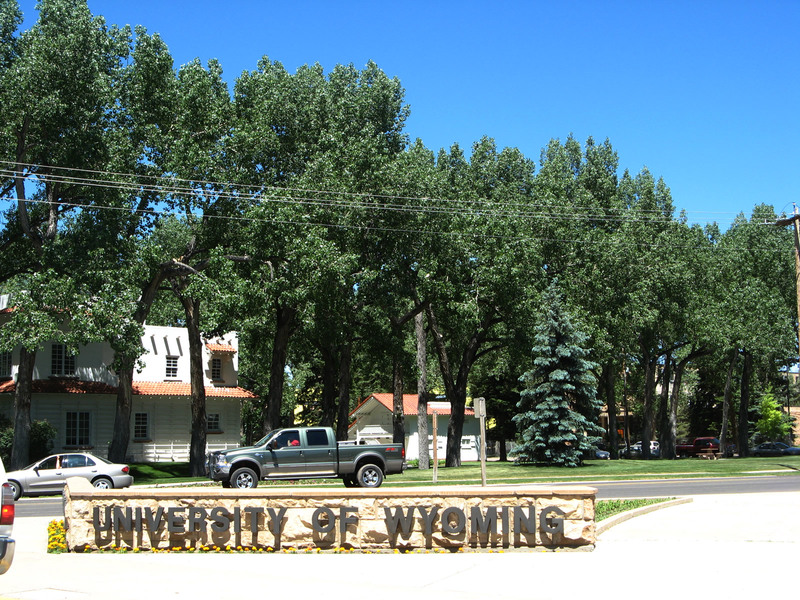 At Ninth Street, Grand Avenue parallels the campus of the University of Wyoming. Turn left (north) here to follow Ninth Street to the west end of the campus (including Old Main and the Classroom Building) or continue straight ahead toward the university information center, university library, dormitories, and stadium. Photo taken 09/07/05. 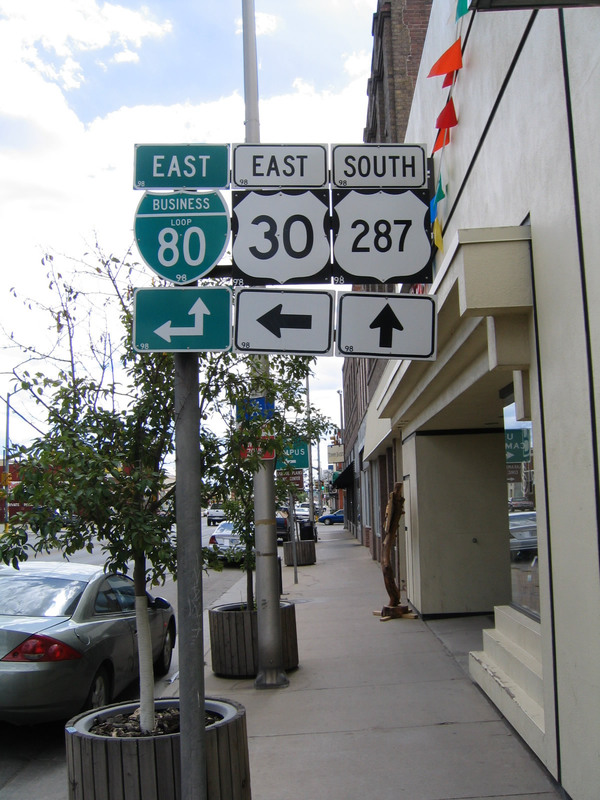 Another shield assembly for "To Interstate 80" and U.S. 30 is posted after Ninth Street. University Neighborhood historic District (page 1) indicates taht "concrete or sandstone sidewalks are laid along all streets of the district, and deciduous and evergreen trees are planted in tree strips and in most yards, adding to the historic character of the district. Setbacks are generally uniform with most front yards open to the sidewalk, giving the district a neighborhood feel. At every corner the name of the street is embossed in the curb. The district is distinctive for its historic residential buildings, pedestrian-friendly atmosphere, tree-lined streets and landscaped yards. 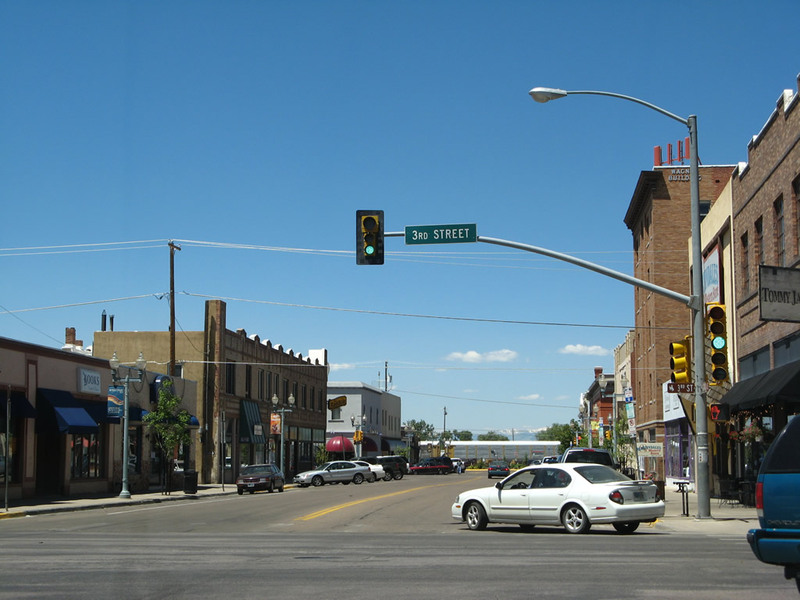 As the primary east-west corridor in Laramie, Grand Avenue serves as both a residential street and a U.S. Highway. Although traffic is heavy at certain times of the day, the presence of large trees and landscaping helps to buffer the homes from the traffic. 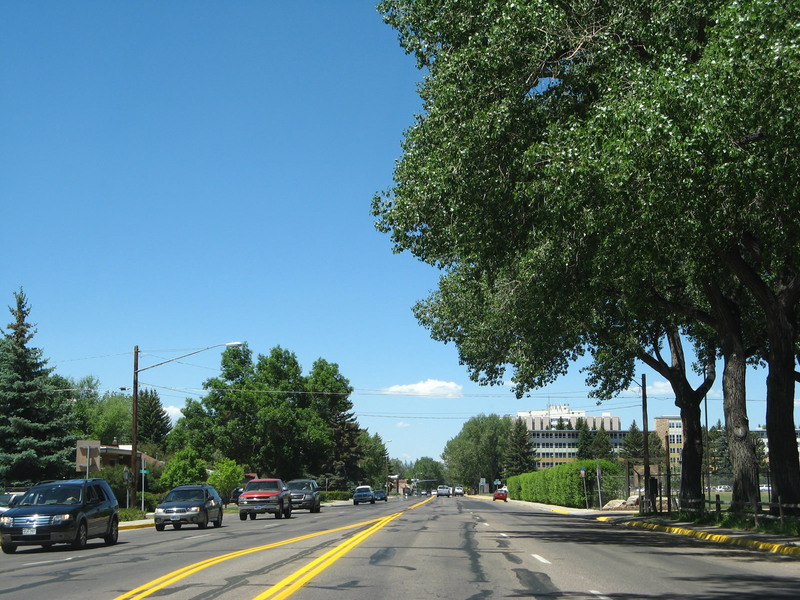 Ivinson Avenue provides the primary access to the University of Wyoming, while Garfield, University, Custer, and the north-south streets are generally quieter and more residential in nature." Photo taken 06/30/08. 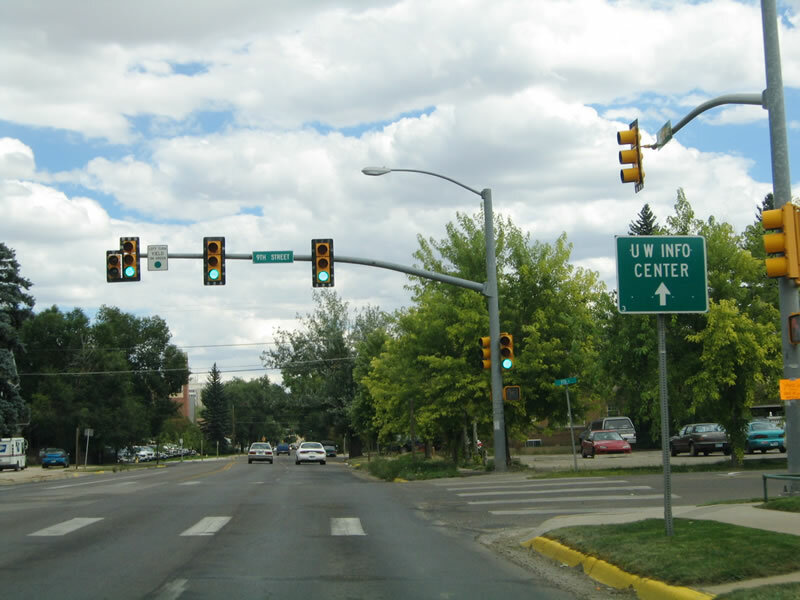 Turn left on 13th Street to the University of Wyoming information center. 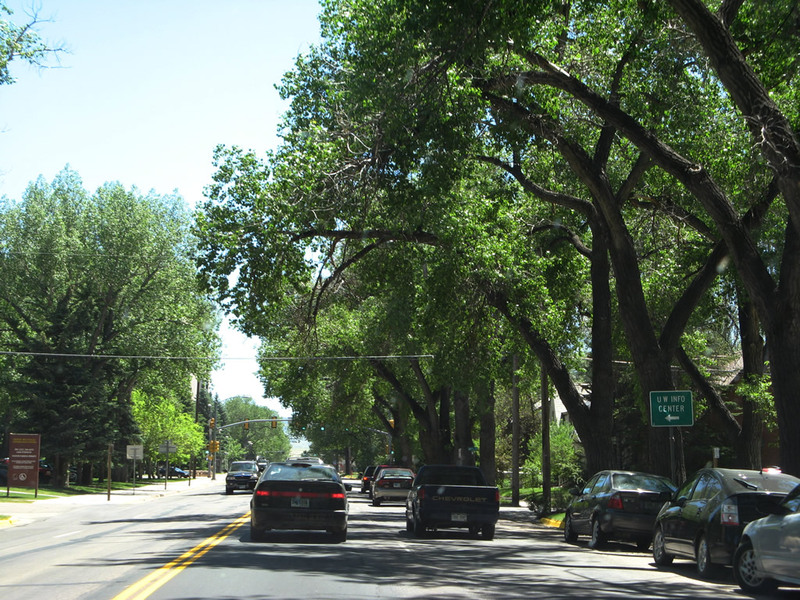 Grand Avenue between Ninth Street and 15th Street passes through a tree district, which is a historic district. University Neighborhood historic District (page 72) reads, "Landscaping was another feature of Laramie’s early town planning. 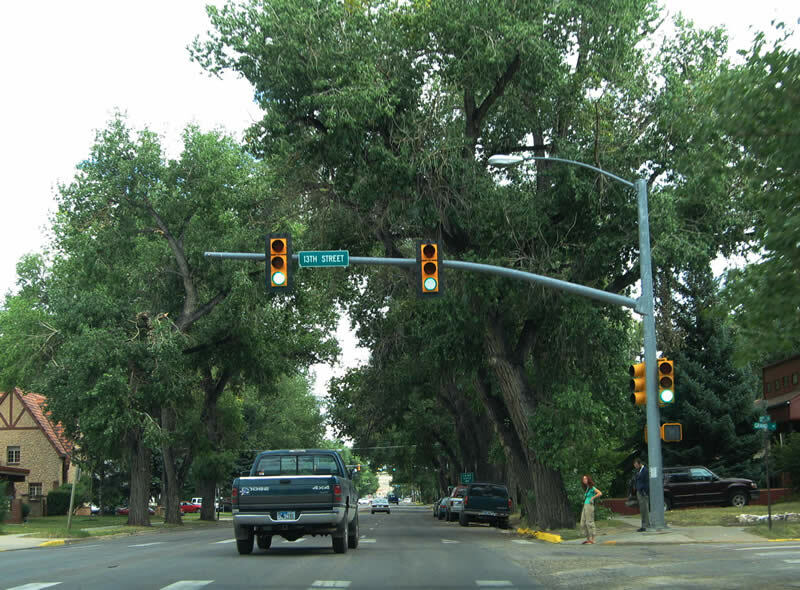 In 1870, the town was described as 'completely treeless,' but soon the tree strips between the sidewalk and the street were planted with cottonwood trees, giving this area the nickname 'Tree Area.' By the end of the 19th century the area was reported to be well-developed with homes having groomed lawns." Photo taken 06/30/08. Use 13th Street northbound to connect to the university library (William Robertson Coe Library) and to Admissions and Records in Knight Hall. The information is located on Ivinson, one block north and then east. Photo taken 09/07/05. 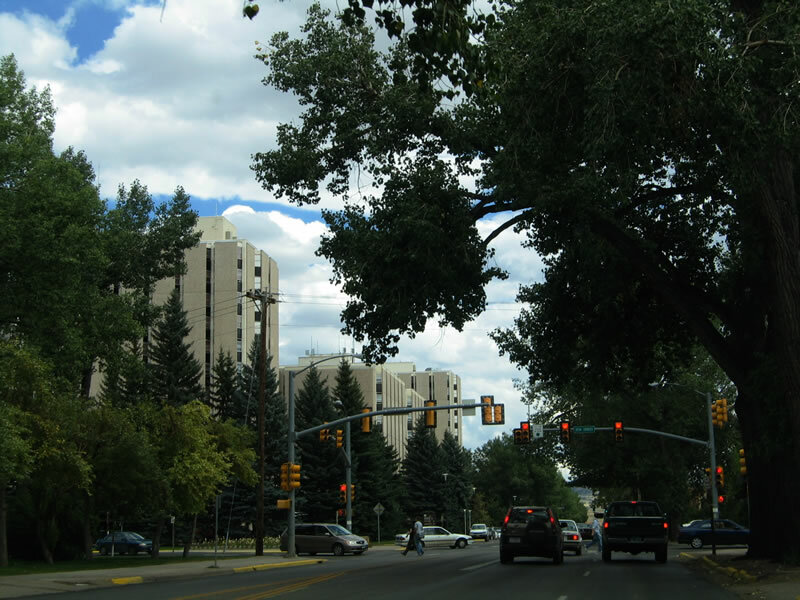 Now approaching 15th Street, the tallest dormitories of the University of Wyoming stand out above the trees. 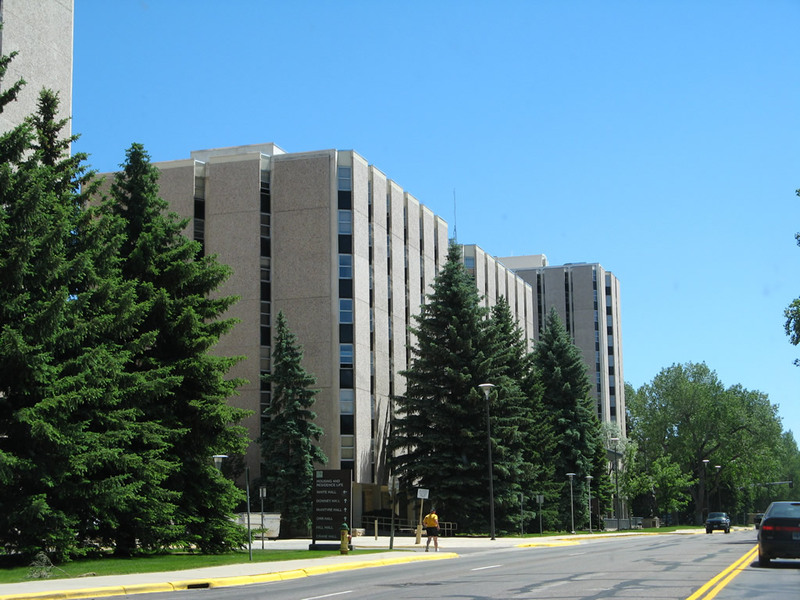 Two of them, White Hall and McIntyre Hall, are the tallest buildings in the state. 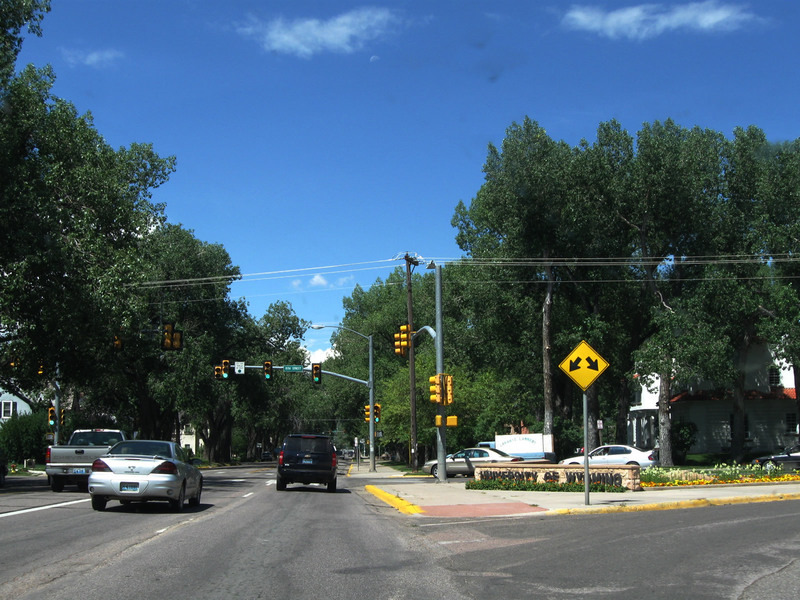 In August 2014, medians were installed along Grand Avenue between 15th Street and 21st Street. This improvement is not yet shown in our pictures. Photo taken 09/07/05. More of the university's dormitories come into view on the north side of Grand Avenue. Photo taken 06/30/08. 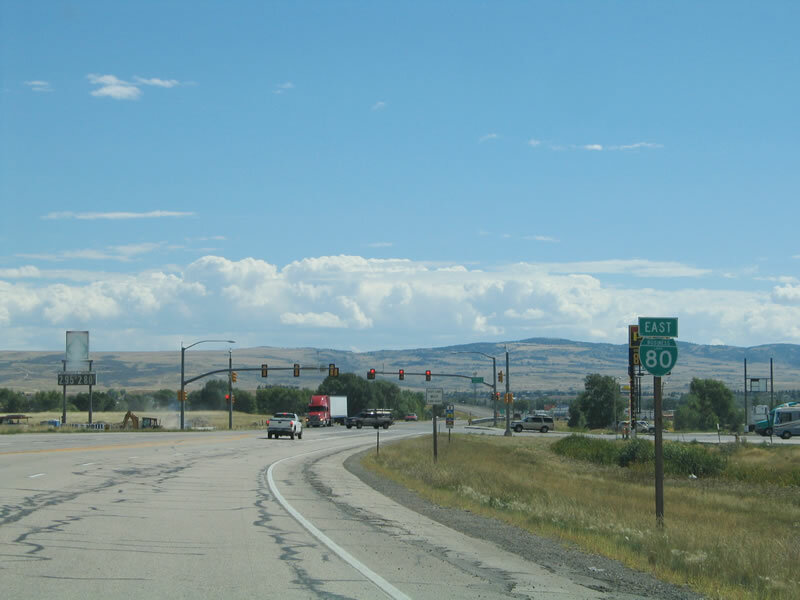 A reassurance shield for U.S. 30 and Business Loop I-80 ("To Interstate 80") is posted a bit further east along Grand Avenue. Photo taken 06/30/08. 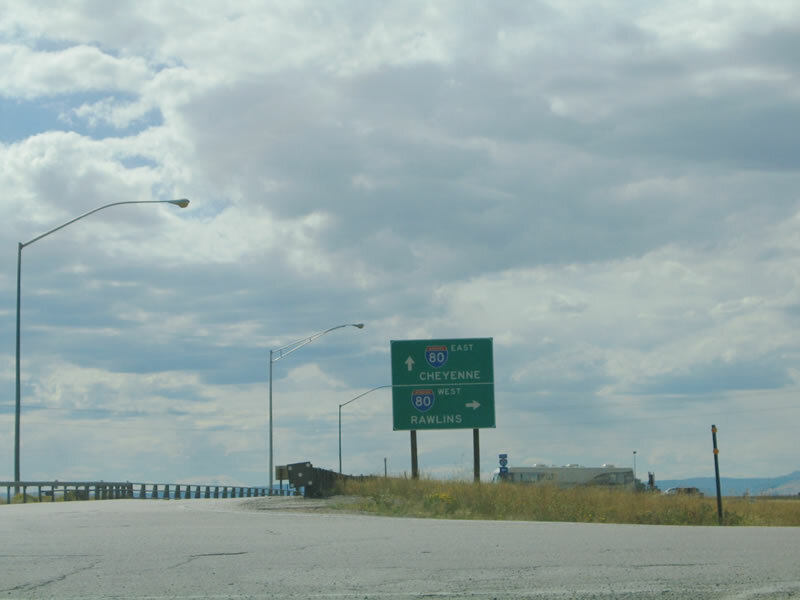 Continuing east, Business Loop I-80 and U.S. 30 pass just south of Washakie Center, the dormitory cafeteria. A statue of Chief Washakie graces the southern face of the cafeteria. Photo taken 11/12/05. 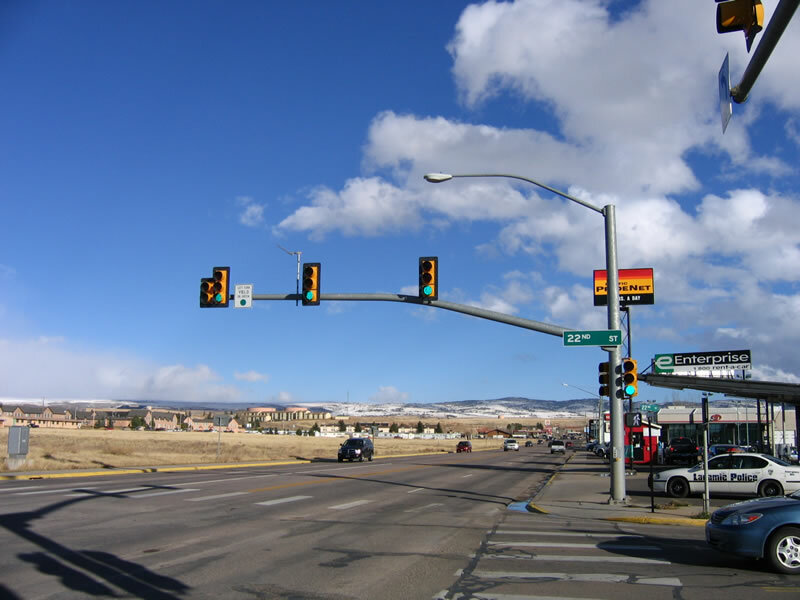 The next traffic signal along eastbound Business Loop I-80 and U.S. 30 is at 17th Street. 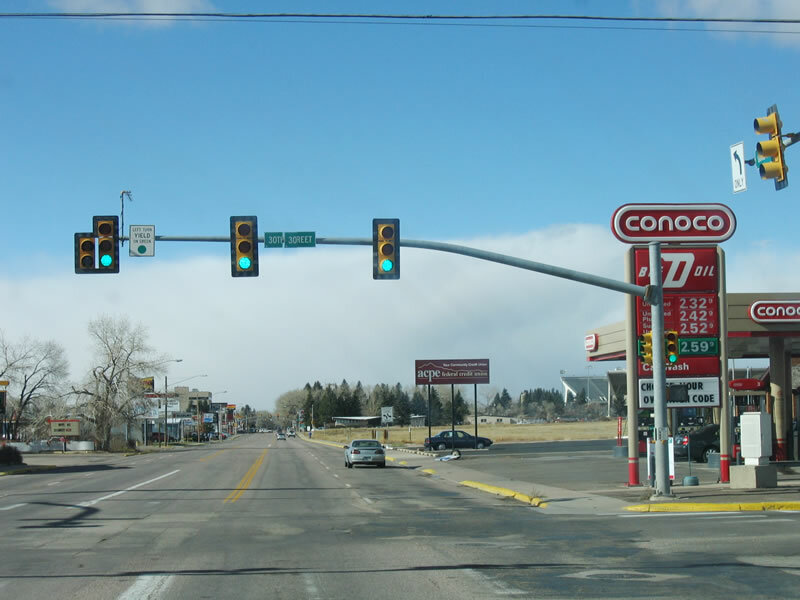 This intersection was only governed by a pedestrian light until around 2000, when it was replaced with a complete intersection traffic signal. Pedestrians frequently cross Grand Avenue here to connect between the dormitories and off-campus commercial establishments, including a second bookstore, restaurants, and other amenities. Photo taken 11/12/05. Eastbound Business Loop I-80 and U.S. 30/Grand Avenue meet 21st Street at this traffic signal. Photo taken 06/30/08. A snow storm was brewing in the early afternoon on this day. This picture shows eastbound Business Loop I-80 and U.S. 30 (Grand Avenue) as they approach 22nd Street, about five blocks east of the prior photograph. Photo taken 11/12/05. 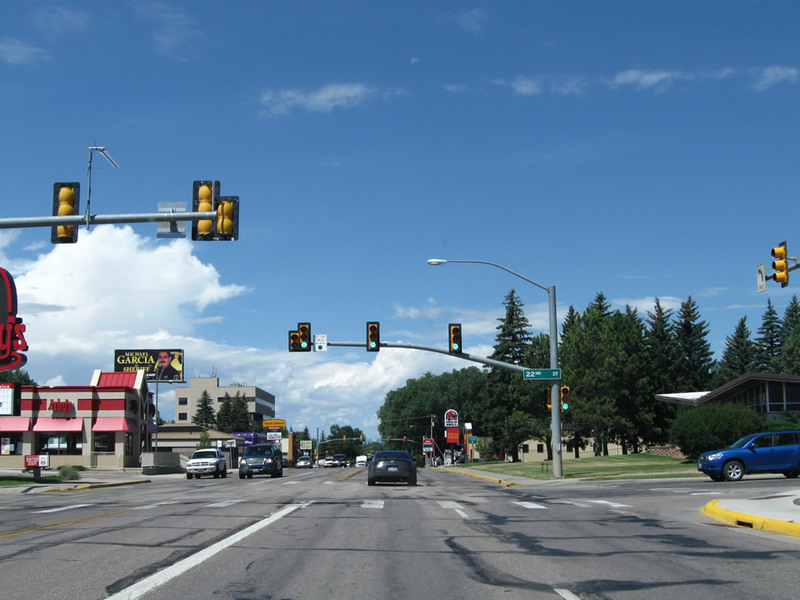 This picture of the same intersection (Grand Avenue and 22nd Street) was much clearer a bit later in the afternoon, just prior to a football game between the University of Wyoming and Brigham Young University. Photo taken 11/12/05. 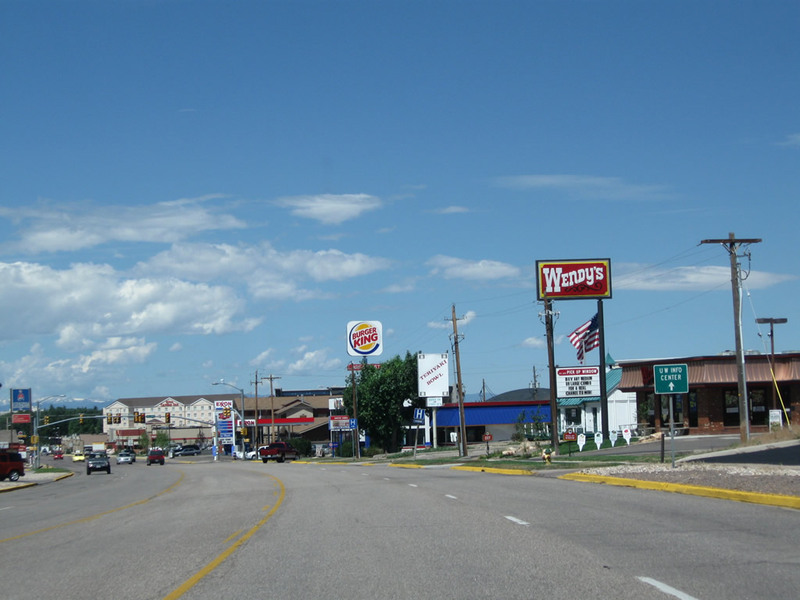 Business Loop I-80 and U.S. 30 enter the city of Laramie via Grand Avenue. 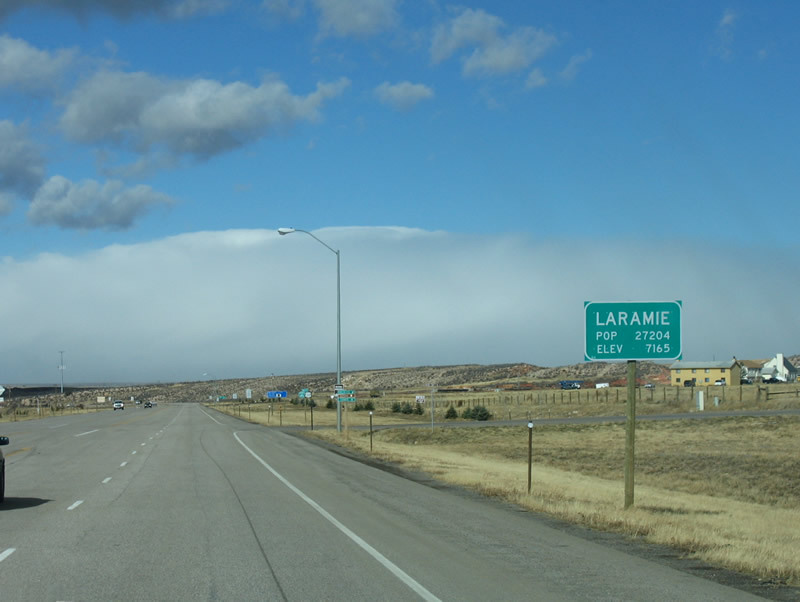 Elevation estimates for Laramie vary; while this population sign states the elevation is 7,165 feet, signs at War Memorial Stadium (University of Wyoming football) indicate that the elevation is 7,220 feet (which may be related to the height of the bleachers at the stadium). Photo taken 11/12/05. 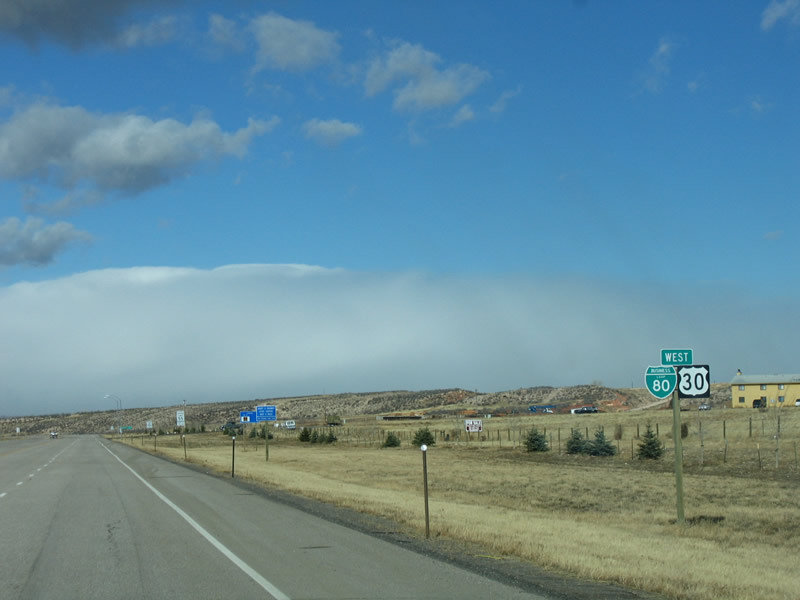 This is the first shield assembly for Business Loop I-80 and U.S. 30 (immediately after the city limits for Laramie). 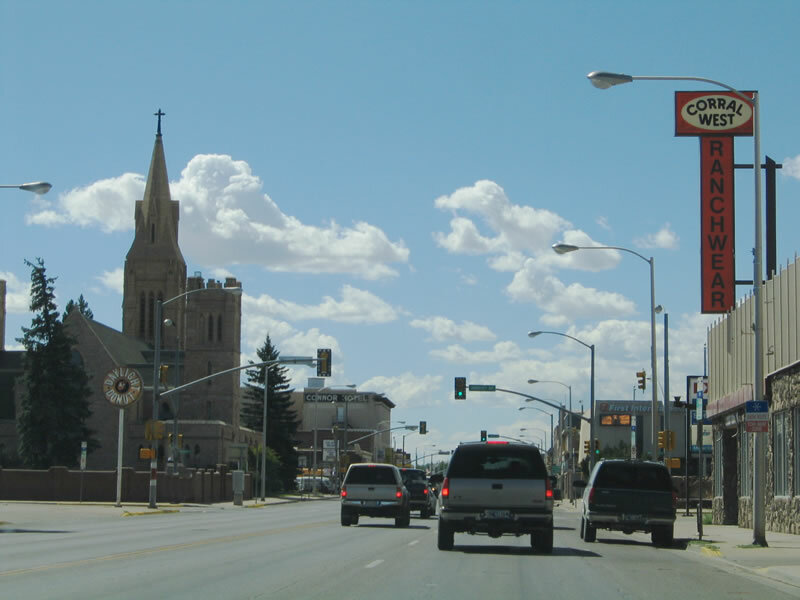 These two routes will remain merged for about four miles along Grand Avenue, then turn north via Third Street (along with U.S. 287). Photo taken 11/12/05. A Wal-Mart Supercenter is located on the south (left) side of Grand Avenue near the Vista Drive intersection. Photo taken 11/12/05. 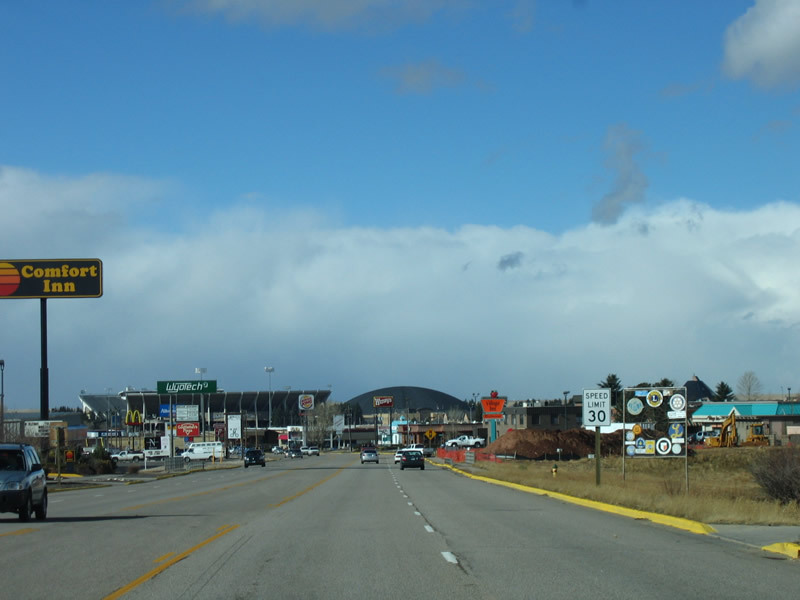 Grand Avenue (Business Loop I-80 and U.S. 30) descends from the area around Vista Drive into Laramie. Development follows Grand Avenue on both sides of the roadway, including restaurants, car dealerships, strip malls, and related services. The dome of the Arena-Auditorium as well as War Memorial Stadium (both part of the University of Wyoming athletic facilities) come into view. Photo taken 11/12/05. 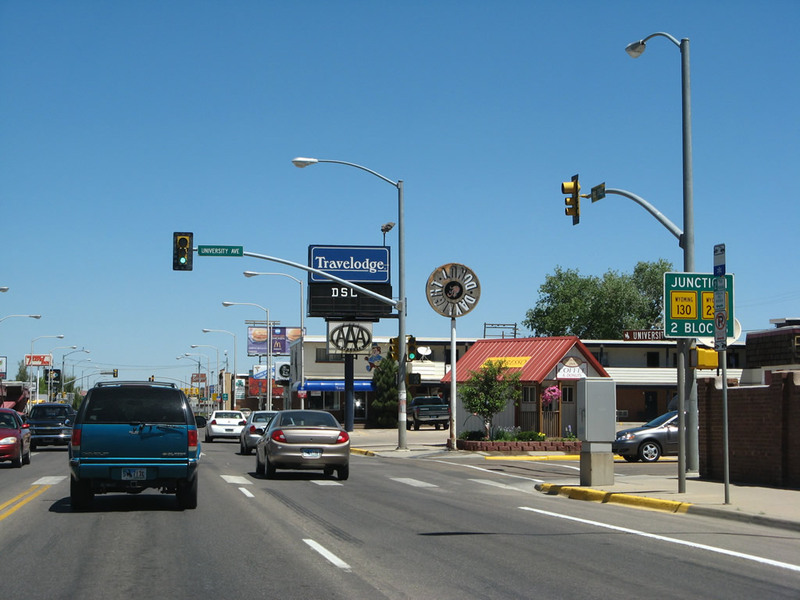 The speed limit drops from 45 to 30 miles per hour as the business loop enters the commercial strip. 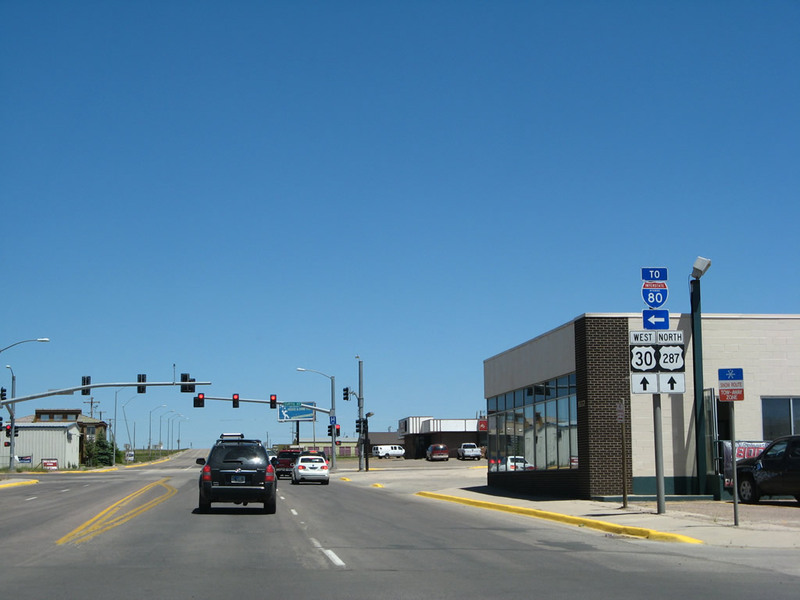 The next signal along westbound Business Loop I-80 and U.S. 30 is for 30th Street. Photo taken 11/12/05. 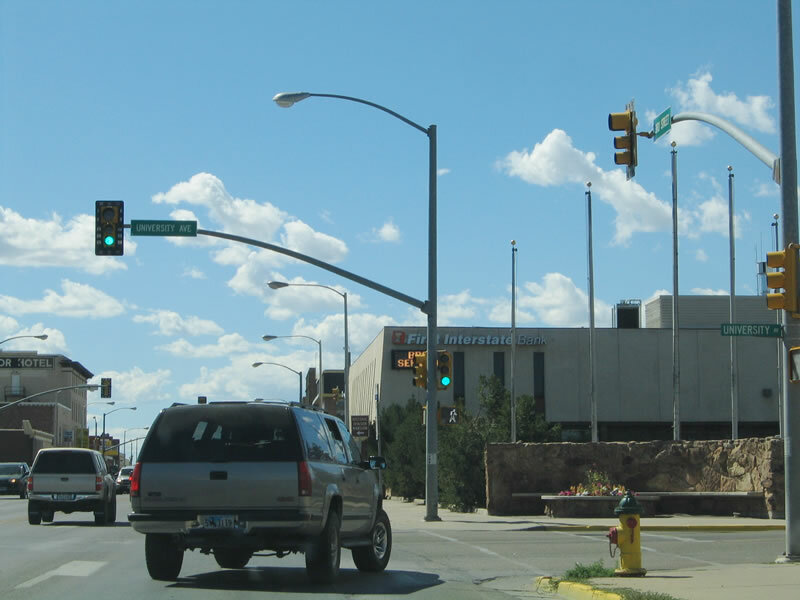 Proceed west on Grand Avenue to 13th Street to visit the University of Wyoming information center. Photo taken 08/02/10. Westbound Business Loop I-80 and U.S. 30/Grand Avenue meets 30th Street at this signalized intersection. 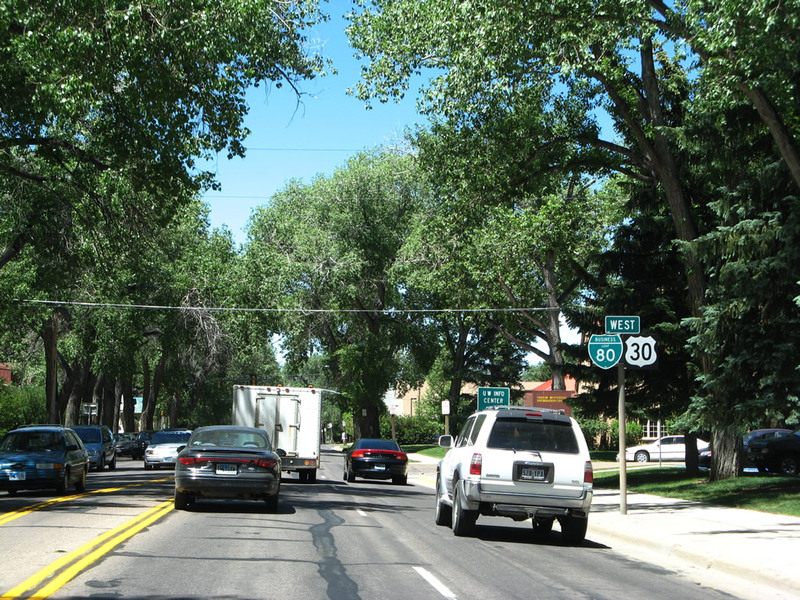 Thirtieth Street travels north toward the university golf course and some of the larger homes to be found in Laramie. New development is evident on the northwestern corner of this intersection between 2005 and 2010. Photos taken 08/02/10 and 11/12/05. Some of that newer development can be seen on the north side of Grand Avenue. Photo taken 08/02/10. 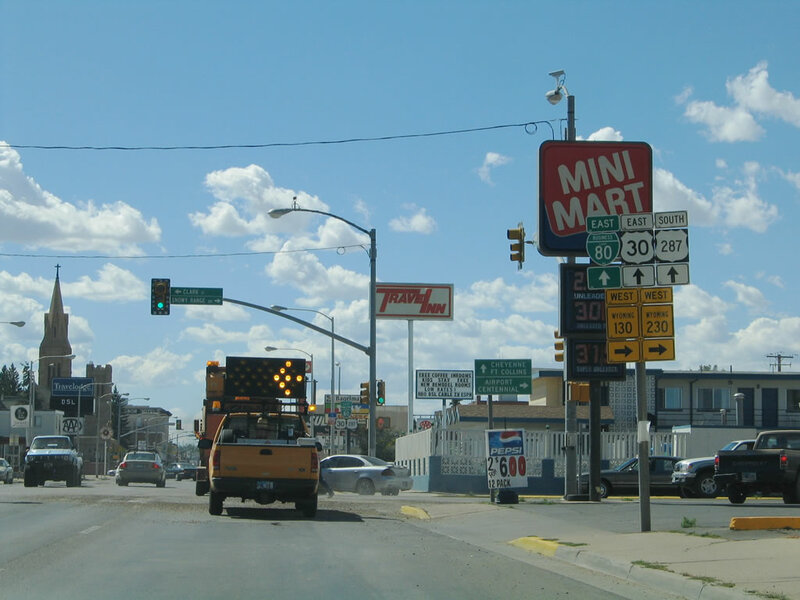 A set of reassurance shields for Business Loop I-80 and U.S. 30 west is posted along Grand Avenue between 25th Street and 24th Street. Photo taken 08/02/10. 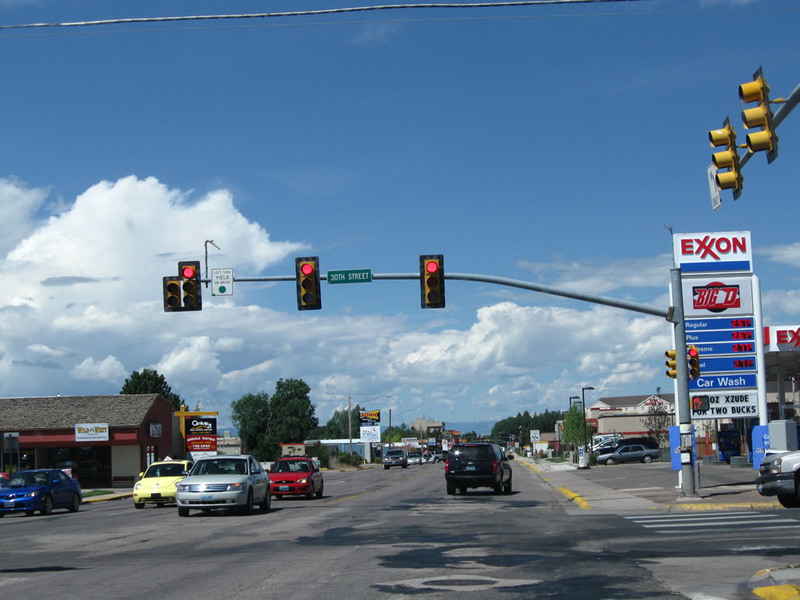 The next traffic signal along Business Loop I-80 and U.S. 30/Grand Avenue west is with 24th Street. Photo taken 08/02/10. Continuing west, the next signal is for 22nd Street. Turn north on 22nd Street to the parking lot for War Memorial Stadium and the Arena Auditorium. To the south, 22nd Street serves a residential area. Photo taken 11/12/05. 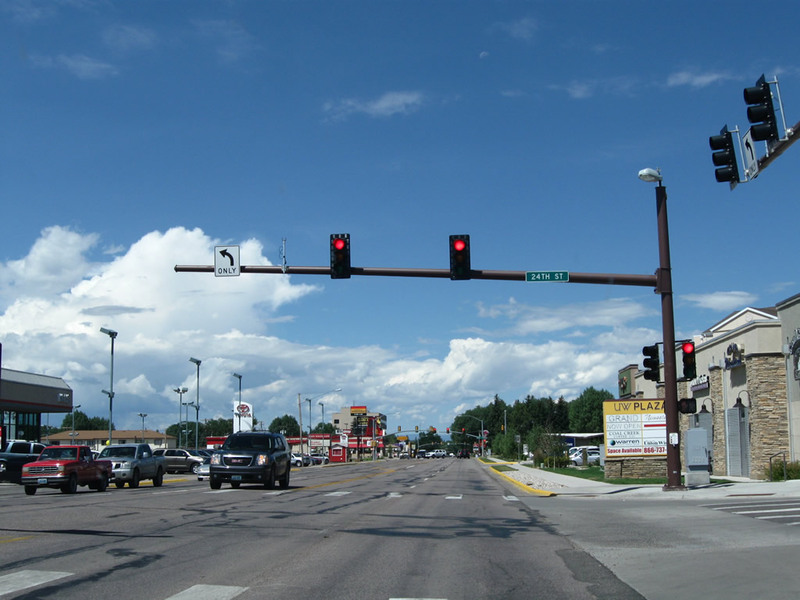 The next signal along westbound Business Loop I-80 and U.S. 30 is for 21st Street, which also provides access south into residential areas. Photo taken 08/02/10. This view looks west along Business Loop I-80 and U.S. 30 after the 21st Street traffic signal just south of War Memorial Stadium. Photo taken 06/30/08. 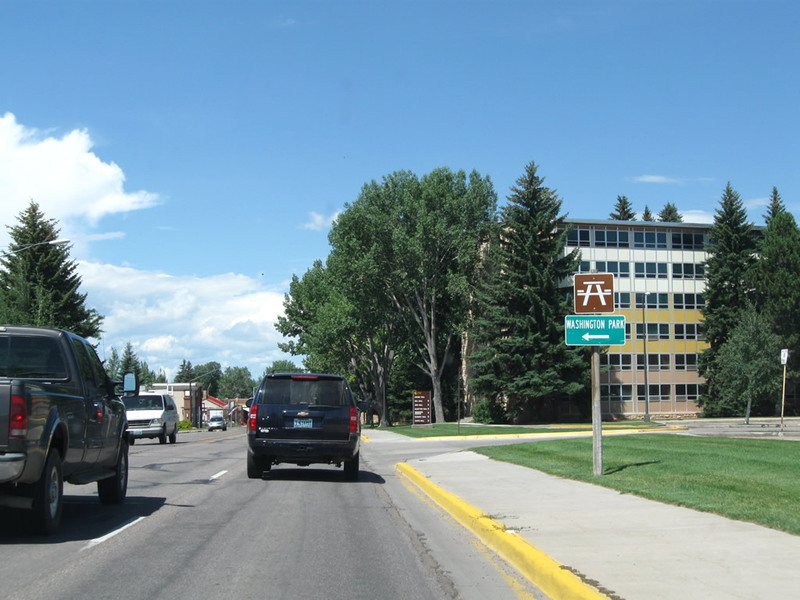 After 21st Street, Grand Avenue passes along the south side of the sprawling campus of the University of Wyoming. 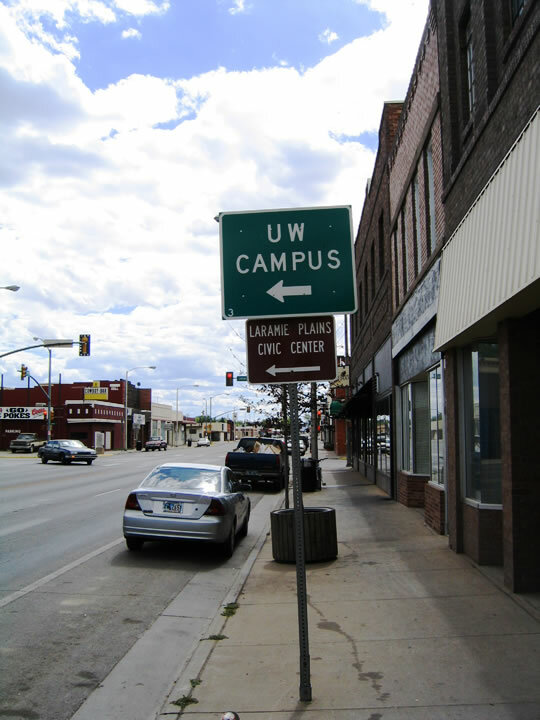 The university extends from 30th Street west to 9th Street along a corridor generally north of Grand Avenue. In this picture, a pair of dormitories is located on the north side of Grand Avenue (Crane Hall and Hill Hall). Photo taken 06/30/08. Turn left from Grand Avenue onto 19th Street south to Washington Park. Photo taken 08/02/10. 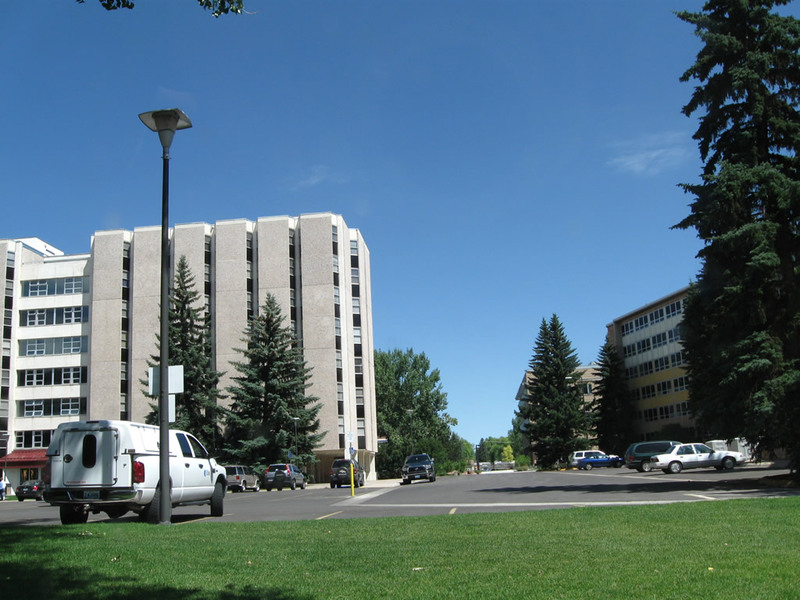 A small parking lot bounded by three University of Wyoming domitories (McIntyre Hall, Orr Hall, and Hill Hall) comes into view on the north side of Grand Avenue. Photo taken 08/02/10. 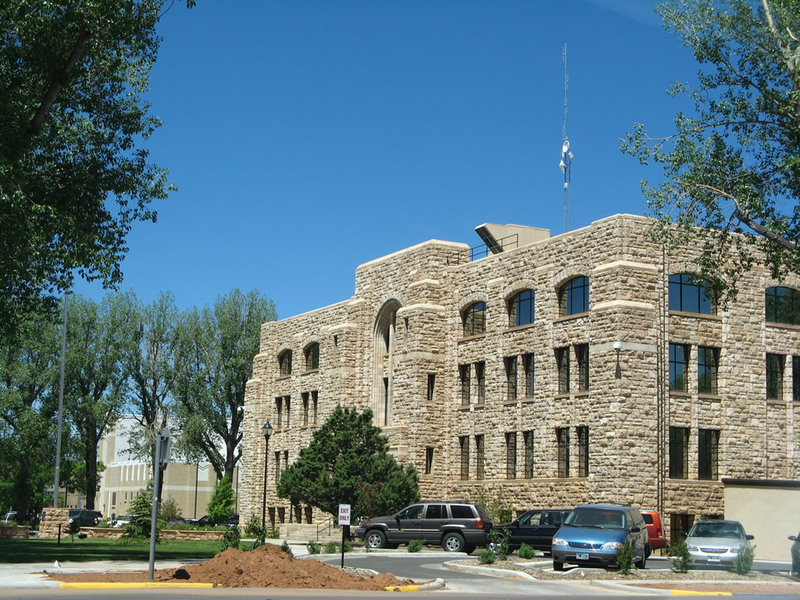 The University of Wyoming domitories line the north side of Grand Avenue between 19th Street and 15th Street. 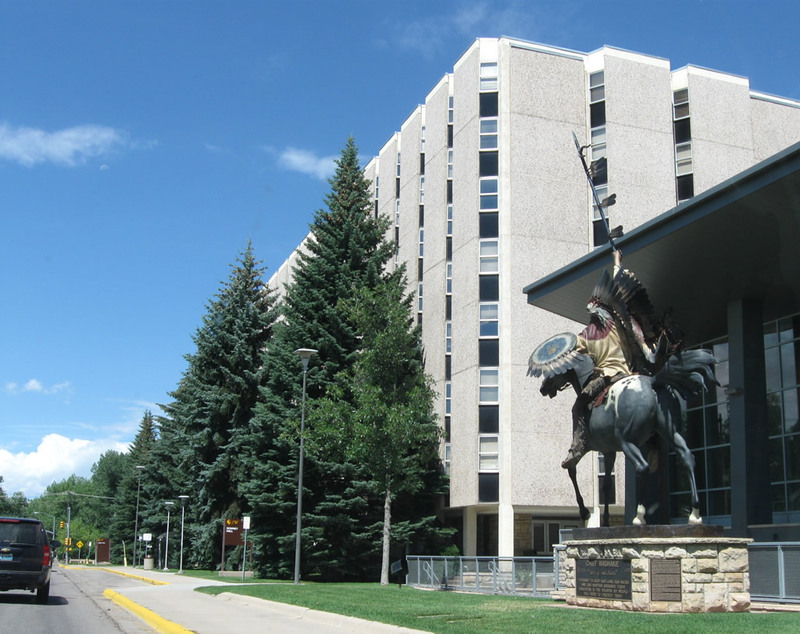 A statue of Chief Washakie is visible near the dormitory cafeteria. Photo taken 08/02/10. 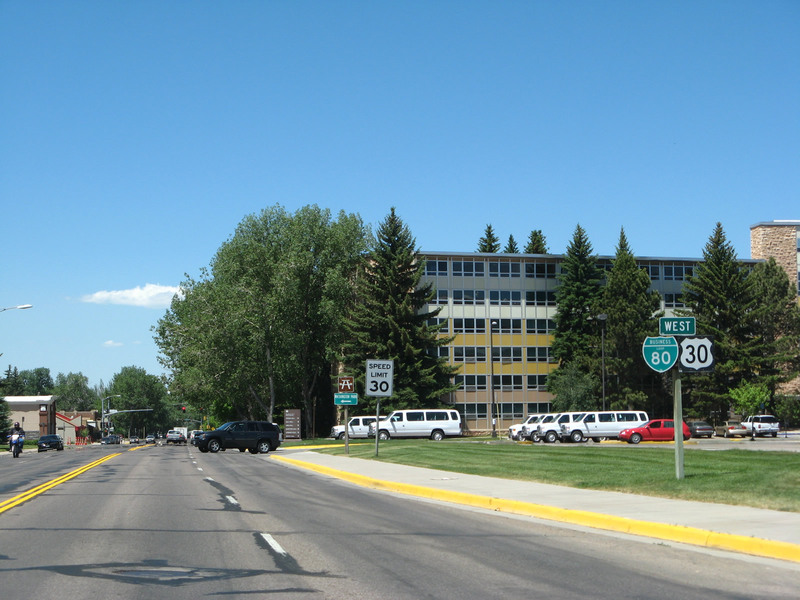 Westbound Business Loop I-80 and U.S. 30 approach 15th Street, a major north-south corridor that passes through the University of Wyoming campus. This intersection is located just west of the block of dormitories (Orr, McIntyre, Downey, and White Halls) between 17th Street and 15th Street. Photos taken 08/02/10 and 06/30/08. 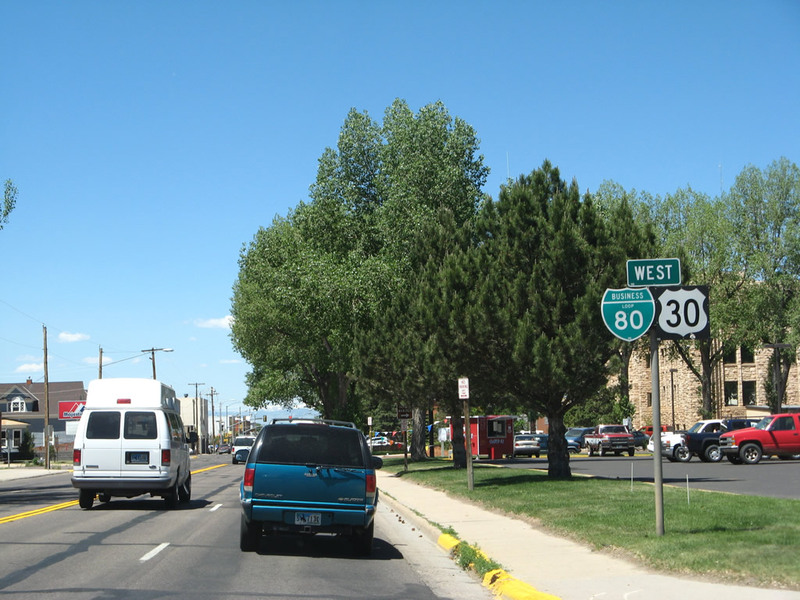 A reassurance shield assembly for Business Loop I-80 and U.S. 30 west is posted between 15th Street and 14th Street in Laramie just south of the university campus. Photo taken 06/30/08. 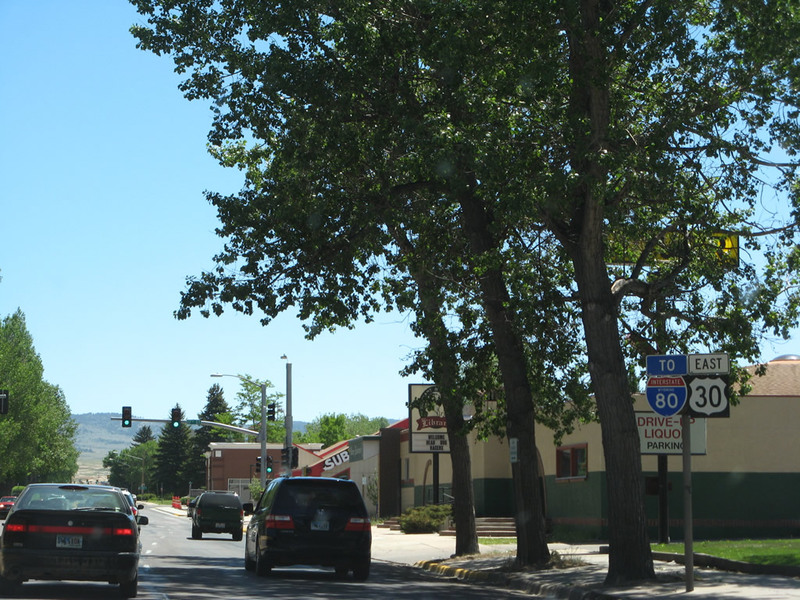 Towering cottonwood trees line Business Loop I-80 and U.S. 30/Grand Avenue between 15th Street and Ninth Street. Here, westbound Grand Avenue approaches 13th Street. Photo taken 06/30/08. Westbound Business Loop I-80 and U.S. 30/Grand Avenue approach Ninth Street. Turn right here to follow Ninth Street along the western edge of the main University of Wyoming campus. Photo taken 06/30/08. Another reassurance shield assembly for Business Loop I-80 and U.S. 30 west is posted a just after the Seventh Street intersection. Photo taken 06/30/08. Between Sixth Street and Fifth Street on the north side of Business Loop I-80 and U.S. 30/Grand Avenue is the Albany County Sherriff's Office. Photo taken 06/30/08. 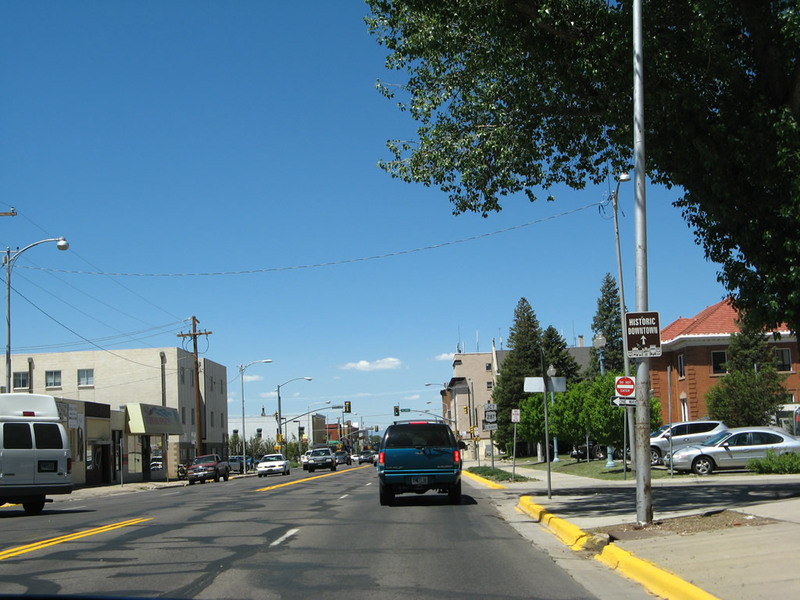 A historic downtown Laramie trailblazer is posted near the Fifth Street intersection; the historic district is located generally west of Third Street, just two blocks ahead. Photo taken 06/30/08. 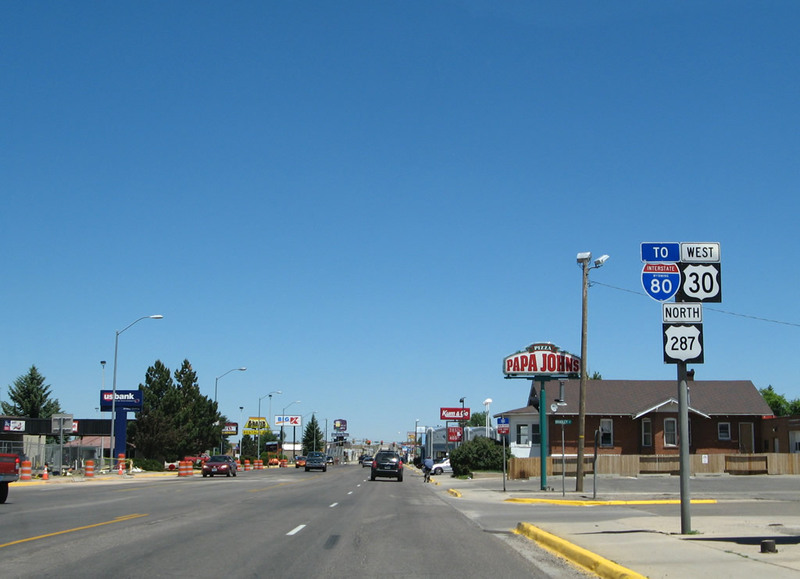 Westbound Business Loop I-80 and U.S. 30/Grand Avenue approach U.S. 287/Third Street in downtown Laramie. 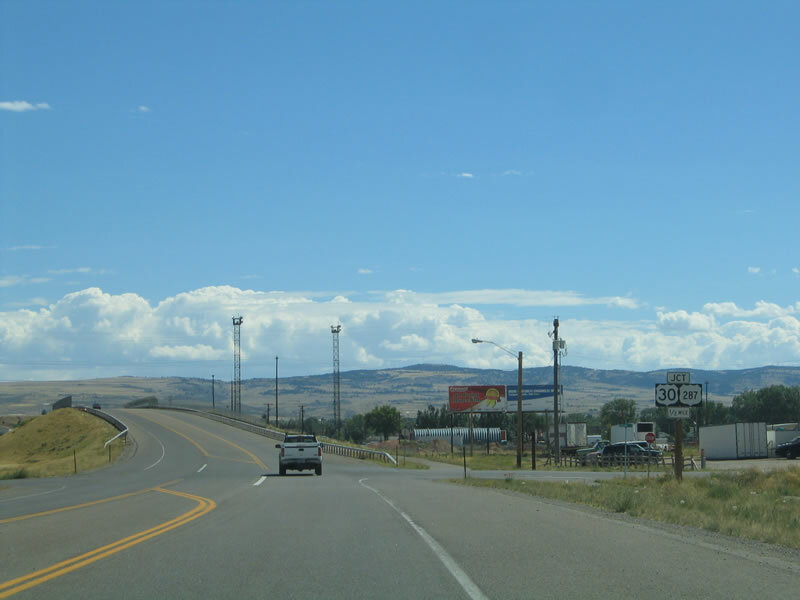 U.S. 287 is a major, northwest-southeast route that links Texas with Montana along a generally diagonal route. Photo taken 06/30/08. 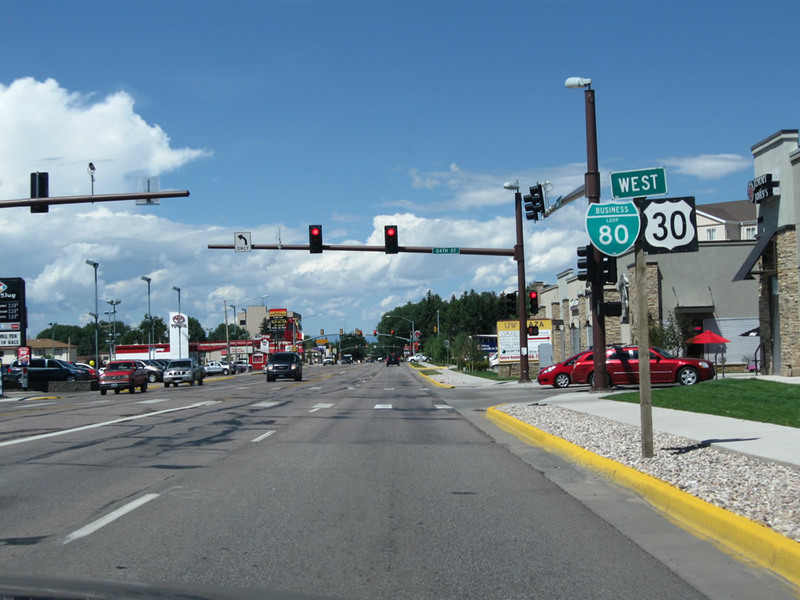 The next signalized intersection along Business Loop I-80 and U.S. 30/Grand Avenue west is with Fourth Street. Photo taken 06/30/08. On the block in between Fourth Street and Third Street, we find this shield assembly pointing the way to westbound Business Loop I-80 and westbound U.S. 30 in downtown Laramie. 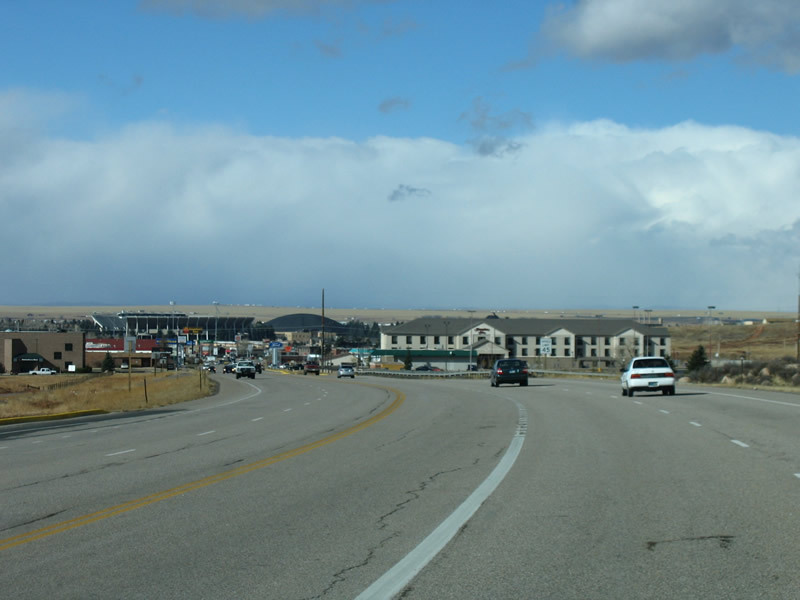 Turn left for U.S. 287 south to Fort Collins or right for U.S. 30-287 and Business Loop I-80 north to Medicine Bow. This sign assembly is something of an error. Yes, U.S. 30 and 287 merge together by turning right (north) along Third Street. However, since this shot is taken from westbound Business Loop I-80, how can Business Loop I-80 go both north and south from this point? 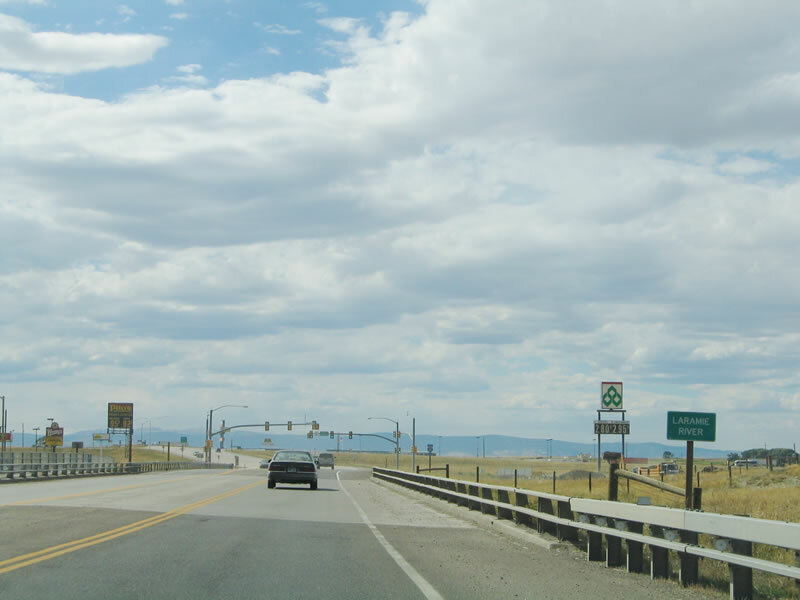 The reason is that travelers may opt to take U.S. 287 south on Third Street to reach Interstate 80 or they may turn north on U.S. 287 and follow the business loop back to Interstate 80 via Curtis Street. Photos taken 06/30/08 and 09/07/05. 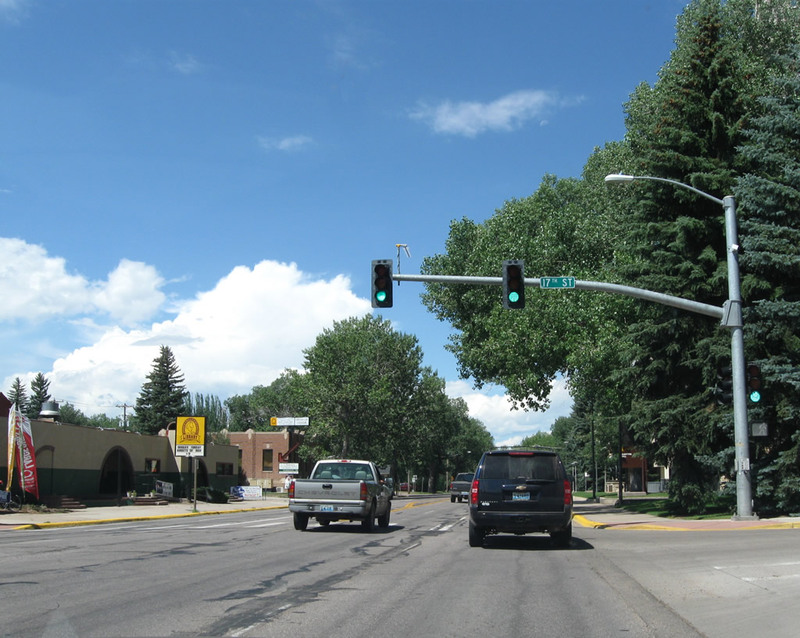 Here is the Third Street traffic signal; the business loop turns right (north). Grand Avenue ends only a couple blocks west of here at First Street near the railroad. Photo taken 06/30/08. After the intersection between Third Street and Grand Avenue, northbound Third Street leaves downtown. 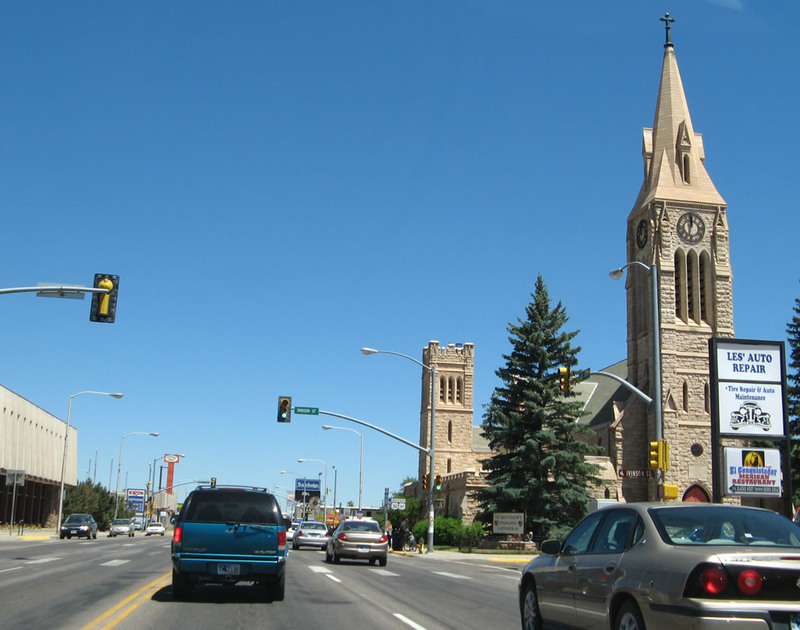 The sandstone church, which dominates the Laramie downtown skyline, is readily visible at the signalized intersection between Third Street and Ivinson Avenue. Business Loop I-80, U.S. 30, and U.S. 287 all travel nearly due north at this point. Photos taken 06/30/08 and 09/07/05. Westbound Business Loop I-80 and U.S. 30 and northbound U.S. 287/Third Street meets Ivinson Street. Photo taken 06/30/08. Northbound Third Street approaches University Avenue. 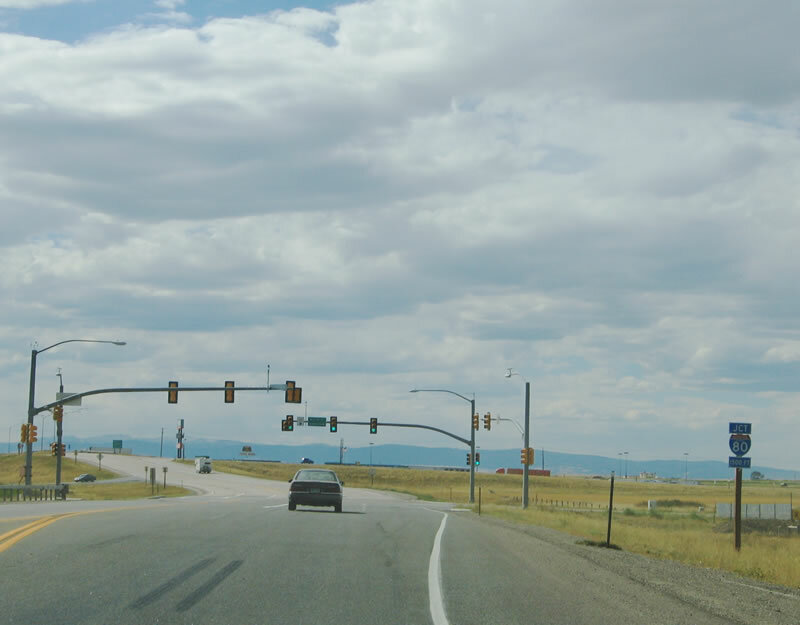 Thereafter, the next major intersection along westbound Business Loop I-80 and U.S. 30 and northbound U.S. 287/Third Street will be with Wyoming 130 and Wyoming 230/Snowy Range Road west and Clark Street east (note small guide sign for this pending state route junction). Photo taken 06/30/08. 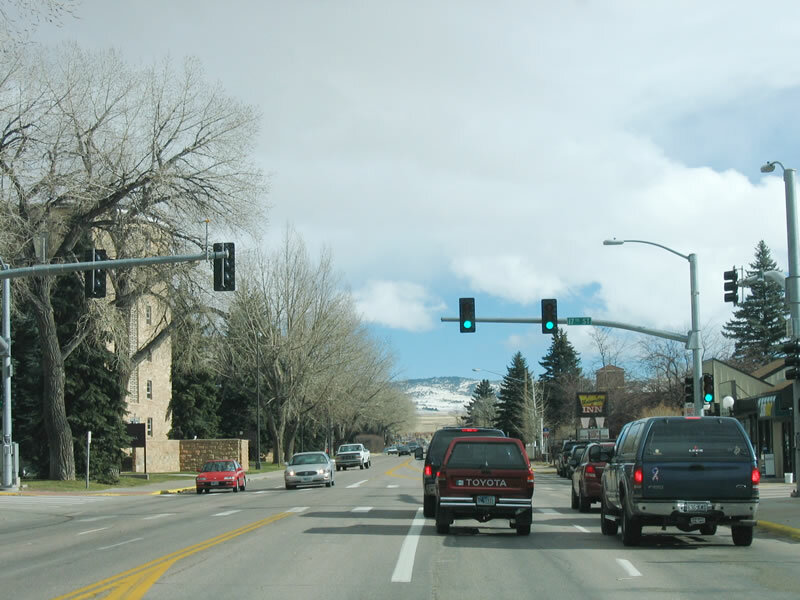 Plenty of traffic follows both directions of Third Street between University Avenue and the intersection with Wyoming 130 and Wyoming 230/Snowy Range Road west and Clark Street east. Photo taken 06/30/08. 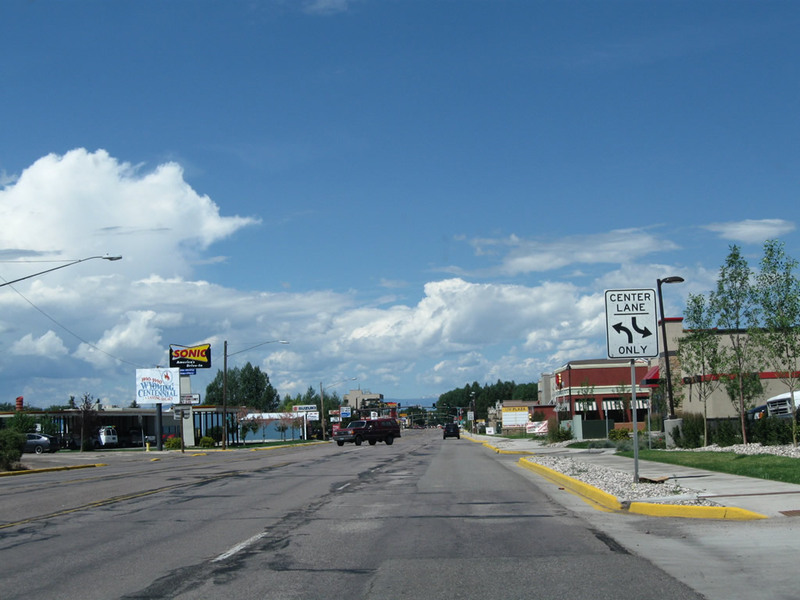 Westbound Business Loop I-80, westbound U.S. 30, and northbound U.S. 287 (Third Street) meet Wyoming 130 and Wyoming 230 (Snowy Range Road/Clark Street) in Laramie. 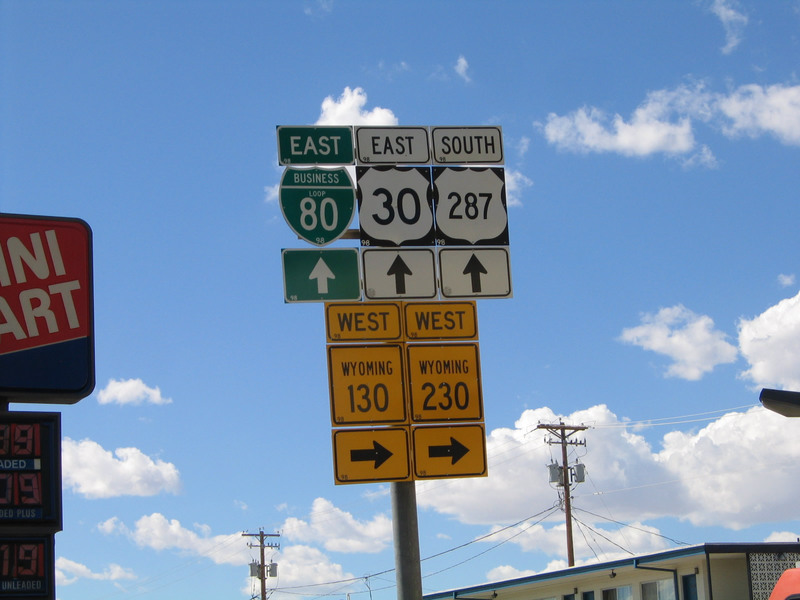 These signs were placed in 1998 per the "98" date code at the bottom of the route markers. Photo taken 08/02/10. 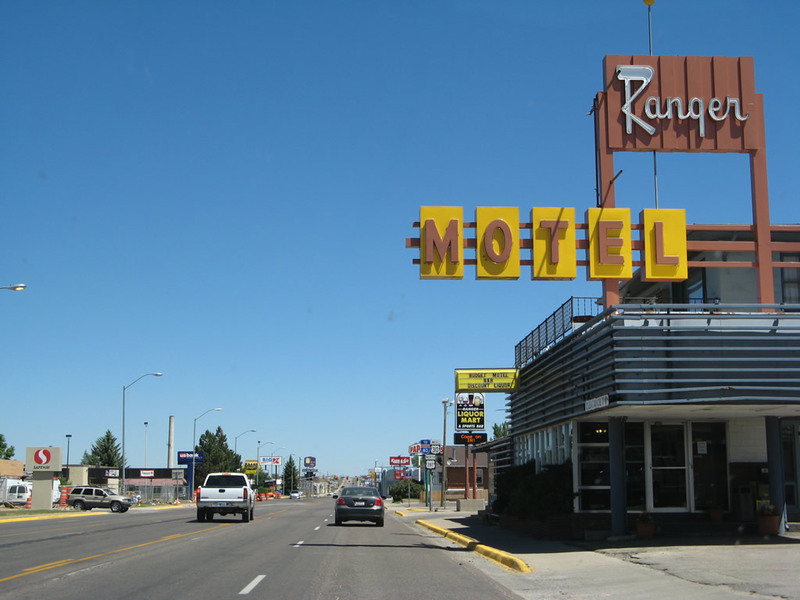 The Ranger motel with its unique marquee sits along the east side of Third Street after the Snowy Range Road intersection. Photo taken 06/30/08. Westbound Business Loop I-80 and U.S. 30 and northbound U.S. 287 have these reassurance shields along northbound Third Street a few blocks after the intersection with Wyoming 130 and Wyoming 230/Snowy Range Road. Photo taken 06/30/08. 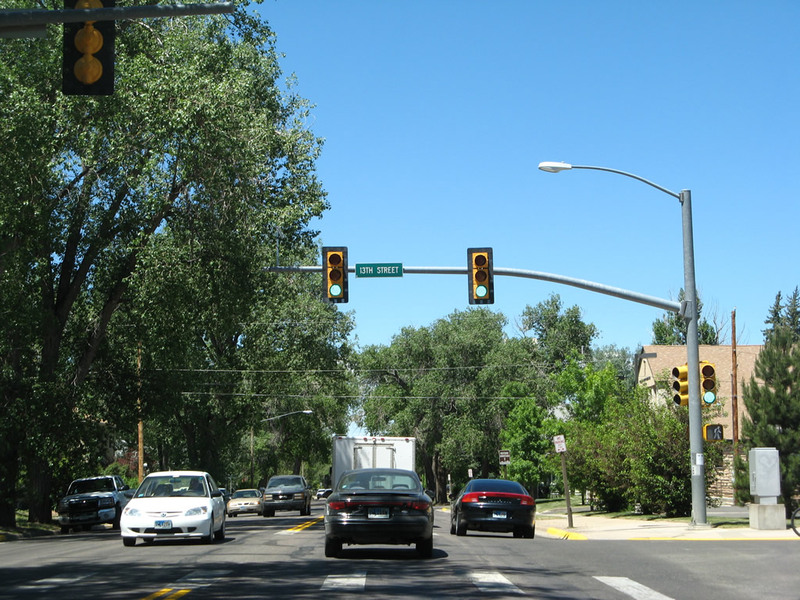 The next signalized intersection along northbound Third Street is with Harney Street. Photo taken 06/30/08. 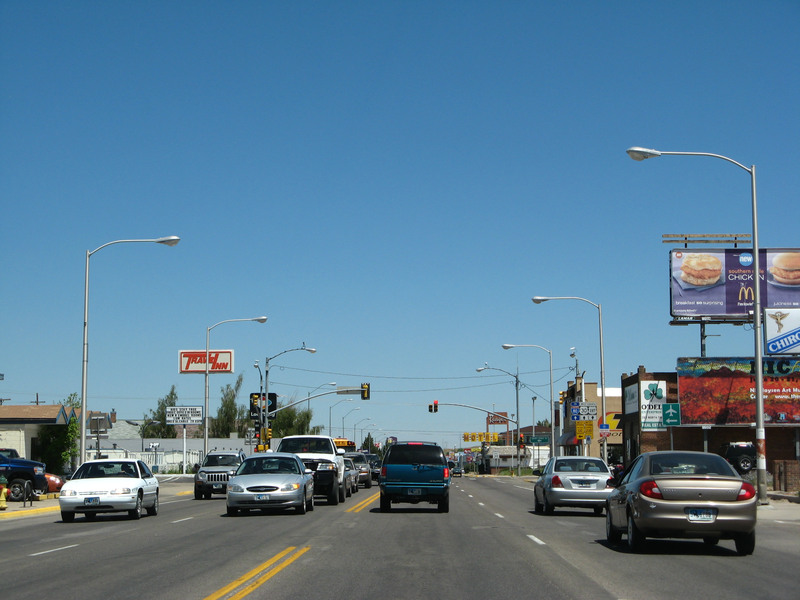 Northbound Third Street (Business Loop I-80 and U.S. 30-287) meets Harney Street. Photo taken 06/30/08. This is the scene along northbound Business Loop I-80 and U.S. 30-287 as the route follows Third Street after the Harney Street intersection. Photo taken 06/30/08. 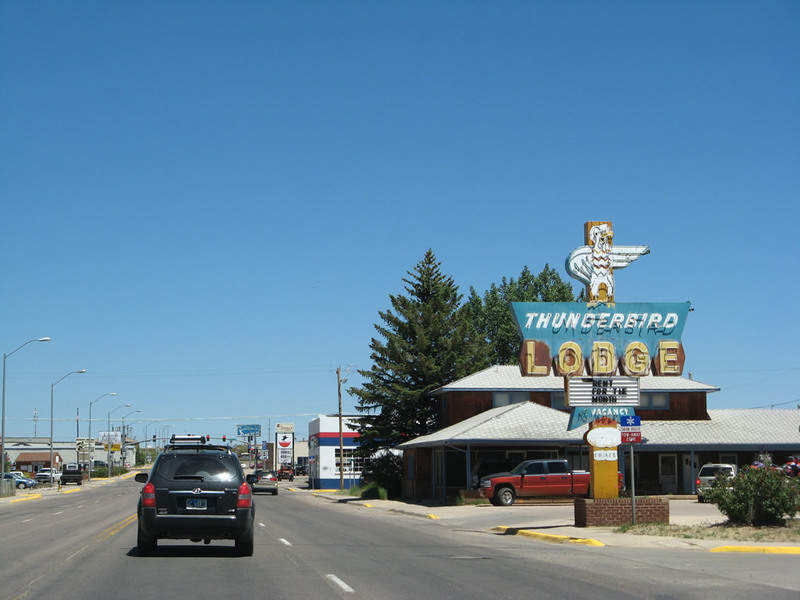 Older motel marquees complete with neon are becoming rarer but still can be found along Third Street at the Thunderbird Lodge. Photo taken 06/30/08. The routes divide at the Curtis Street intersection. Business Loop I-80 turns east onto Curtis Street, while U.S. 30-287 continue north on Third Street toward Bosler and Rock River. Photo taken 06/30/08. 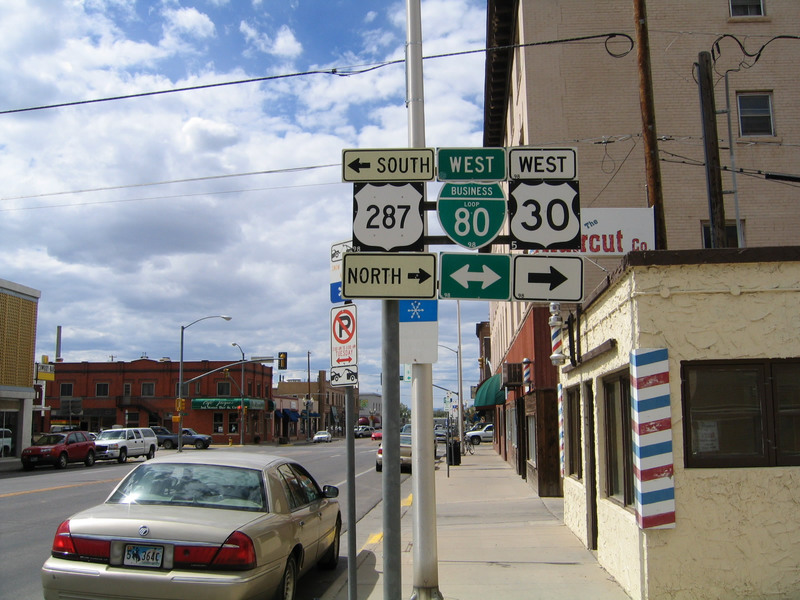 By this point, Business Loop I-80 west is signed as "To Interstate 80," while U.S. 30-287 are shown to continue north on Third Street at the Curtis Street intersection. Photo taken 06/30/08. 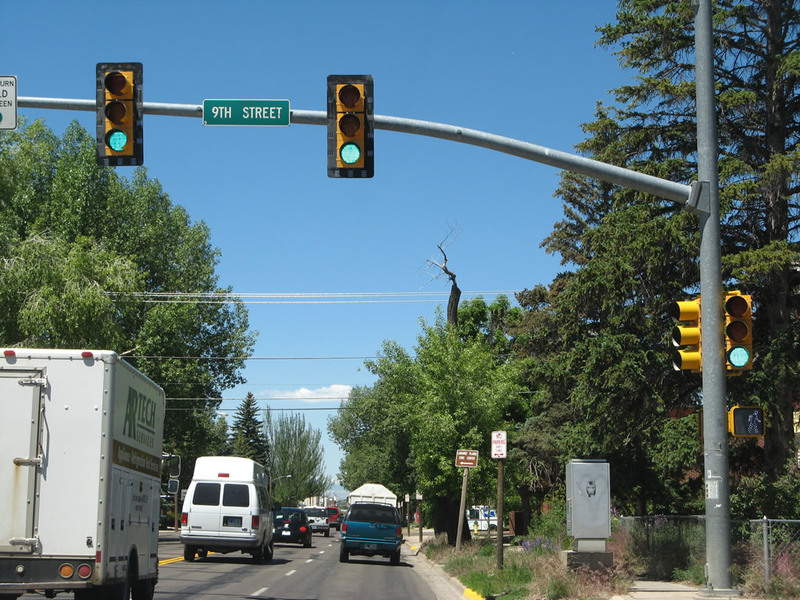 Here is the traffic signal for the Third Street and Curtis Street intersection. Photo taken 06/30/08. To return to Interstate 80, westbound Business Loop I-80 follows Curtis Street west over the Union Pacific Railroad. Photo taken 09/07/05. Cresting over the Union Pacific Railroad, Business Loop I-80/Curtis Street continues west toward Interstate 80. Photo taken 09/07/05. Westbound Business Loop I-80/Curtis Street approaches Interstate 80. 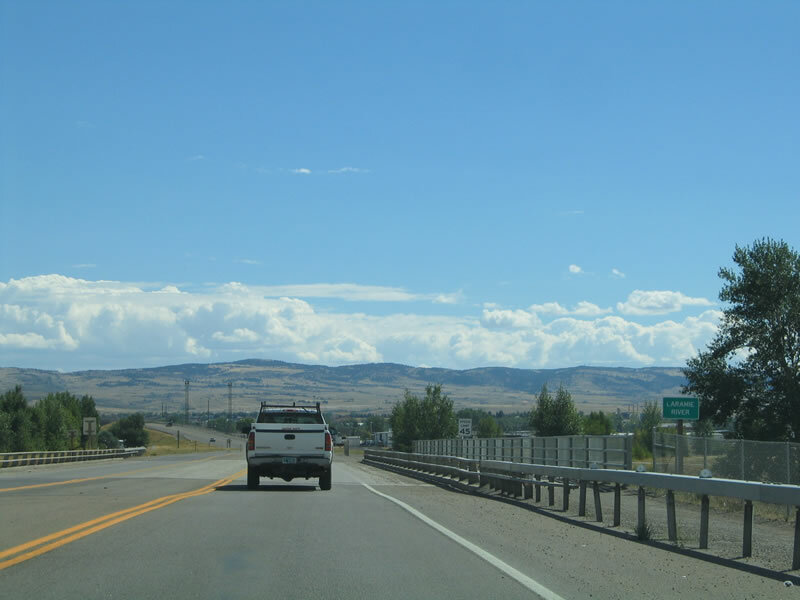 Interstate 80 travels northwest along the north slope of the Snowy Range, passing through Arlington and Elk Mountain en route to Rawlins and western Wyoming. Photo taken 09/07/05. 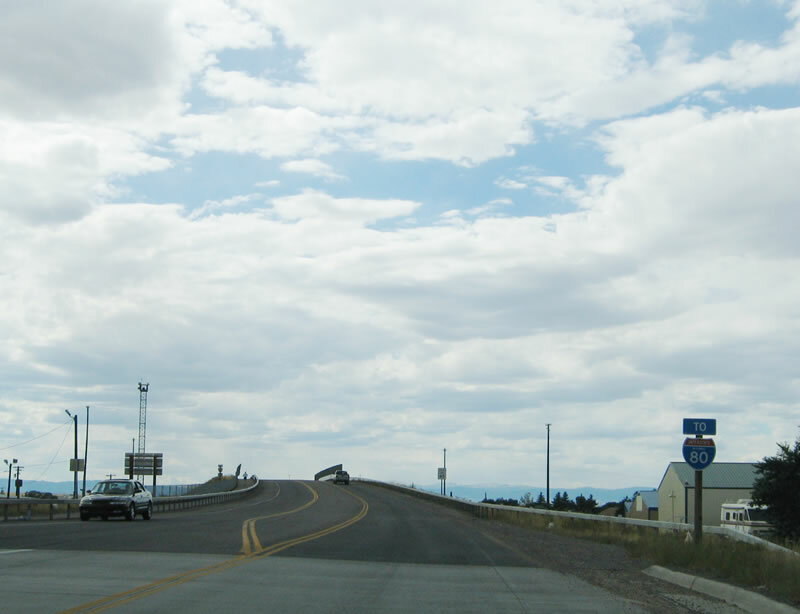 The first ramp connects to westbound Interstate 80 to Rawlins; the second ramp connects to eastbound Interstate 80 to U.S. 287 south and to Cheyenne. Photo taken 09/07/05. Page Updated September 10, 2014.